If creating tablescapes and decorating aren’t second nature to you, hopefully you can carry something away from this page that will be of help. I’ll add to it periodically (newest tips are toward the bottom), but if you have pressing questions or concerns, please shoot me an email or let me know in the “Comment” section at the bottom of the page. I’ll turn it into a Table Twenty-One Tip! White plates are always in! 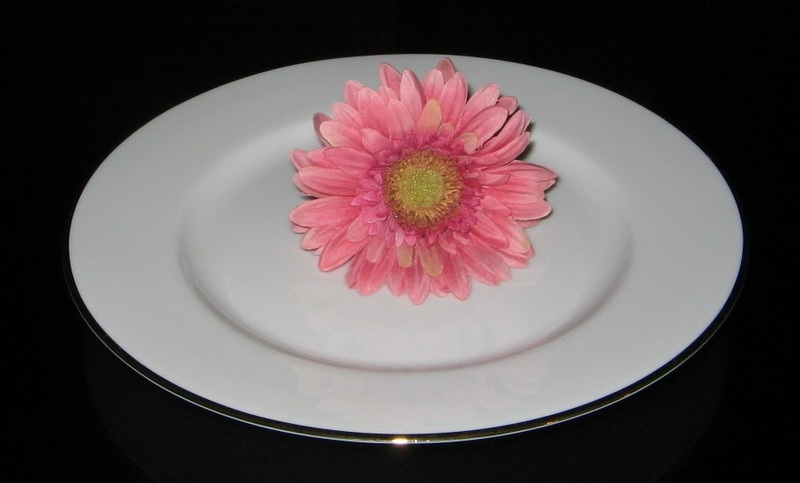 As in art, they serve as the perfect blank canvas for fabulous food presentation. If you have white plates and/or bowls, you have the perfect start to endless gorgeous color combinations (including monochromatic) and exquisite future tablescapes! 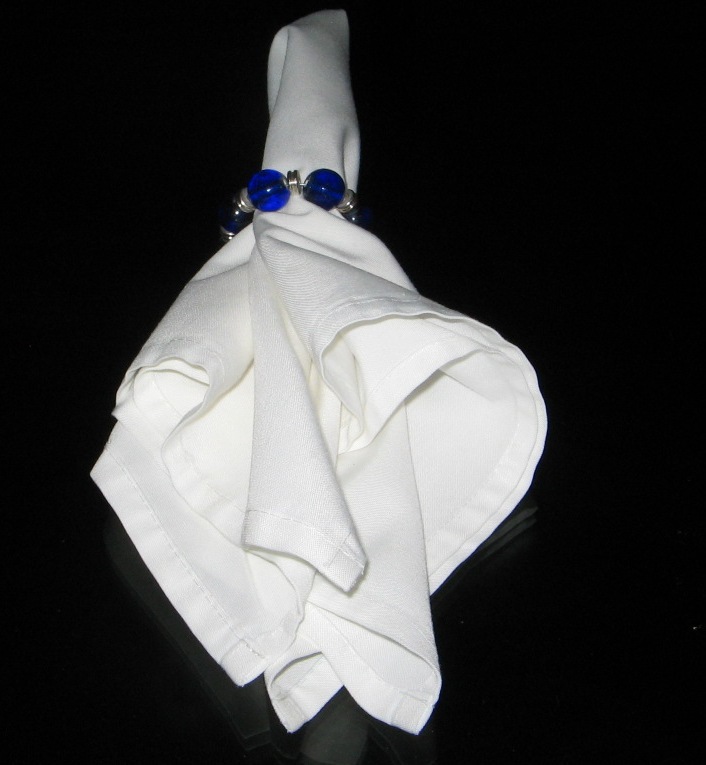 Napkin rings are the “jewels” of the tablescape. Invest in several sets ranging from silver (a must for many formal settings), to colorful rings in glass, wood, or rattan. Take a look at the predominant metal used in your dining space, and consider purchasing rings in that medium (oxidized iron, stainless steel, copper, etc.). If you can’t find table linens in the color(s) or pattern(s) you desire, head for the fabric store! There are hundreds, maybe even thousands of varieties from which to choose. If you’re handy with a sewing machine (which I am NOT! ), just stitch the edges. If, like me, you got a D in high school sewing class, use a little Stitch Witchery or similar product. 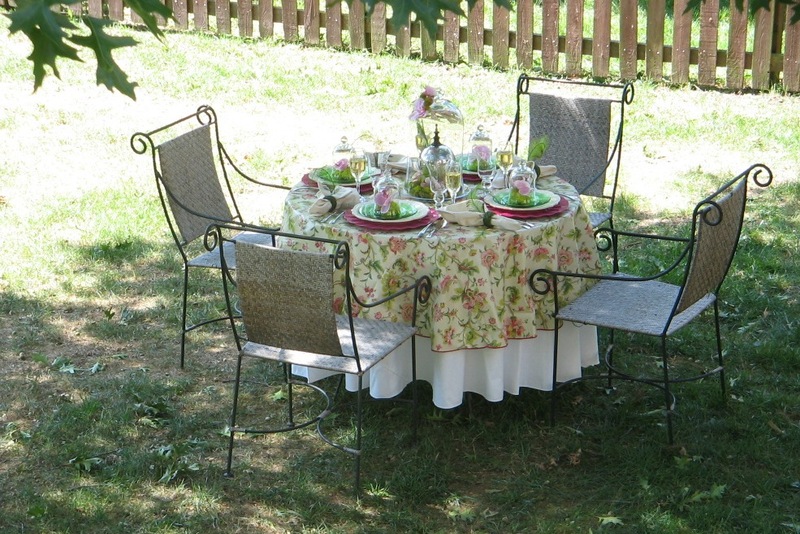 For outdoor tables, you can sometimes even get away with “as is” fabric as long as it is evenly cut and there is no visible selvage edge. Shopping for table coverings at the fabric store is fun and often saves lot of money, especially if you hit the remnant table! 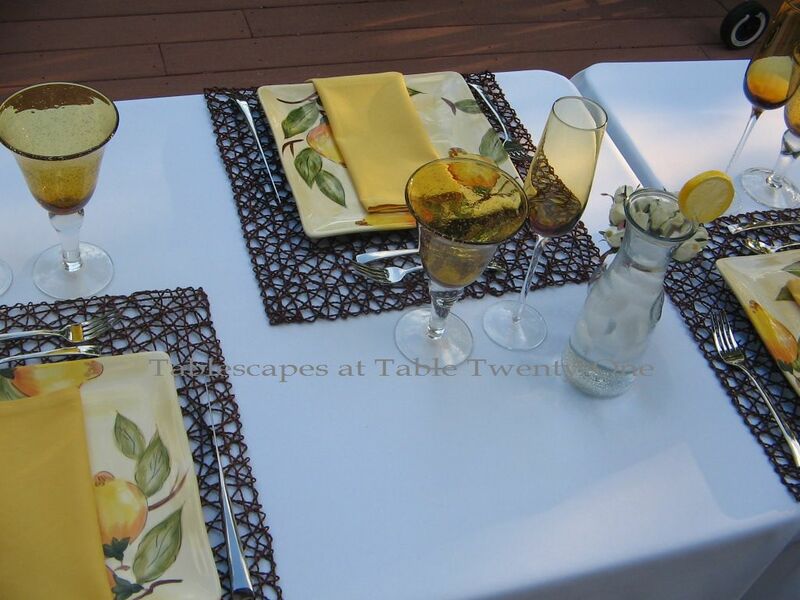 Click here to see another table using a fabric overlay! There’s nothing wrong with melamine dishes! There are so many fun, fabulous colors and designs currently available. Stores like Target, Costco, even Crate & Barrel stock them! Use alone, or mix and match with ironstone, earthenware, glass or ceramic pieces. Click here to see the entire table for the photo below. 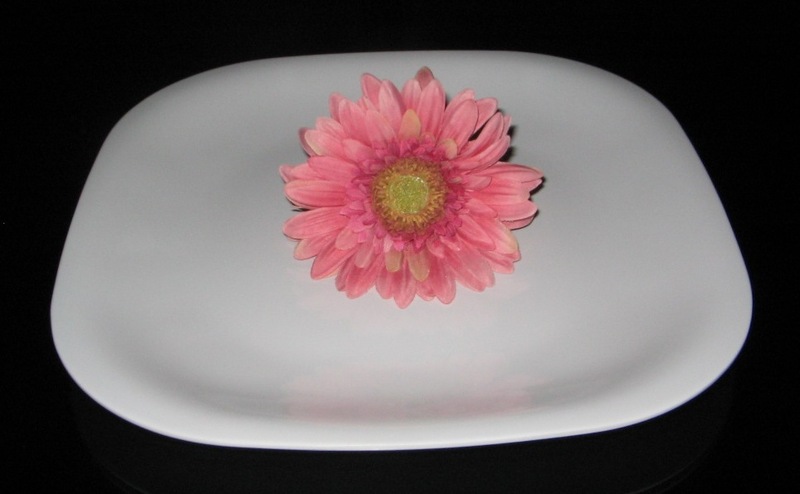 Click here to see another fun table using melamine dishes! Many tablescape gurus will poo-poo the idea of using a vinyl table covering, but I say if you see one with a really fabulous design that is well-made…go for it! Waverly has a great line of vinyl table coverings available at Marshalls and Home Goods. Just be sure to give it a good smoothing over (a hot, wet cloth usually does the trick! ), and tug really hard on the sides to tame it and eliminate deep wrinkles. Fresh whole fruits and vegetables are a wonderful (and cost-effective!) 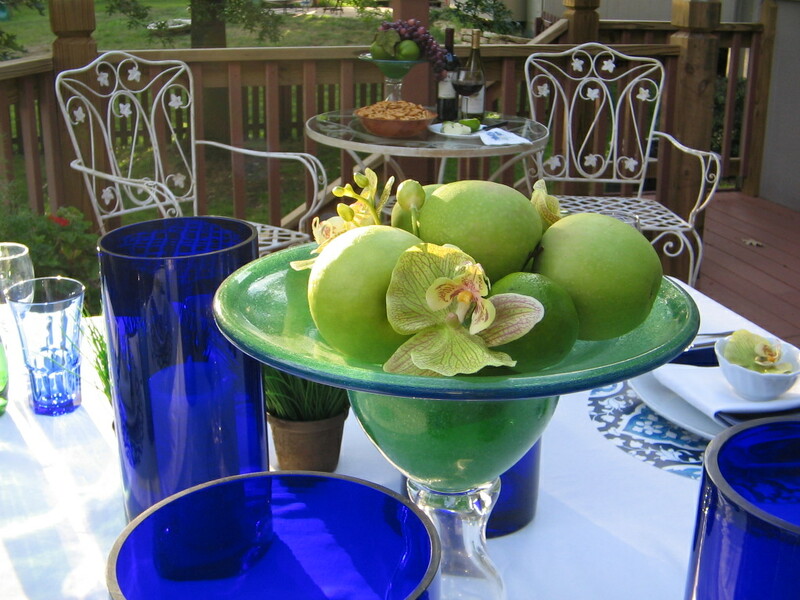 way to add color, texture, dimension and interest to a tablescape year-round. 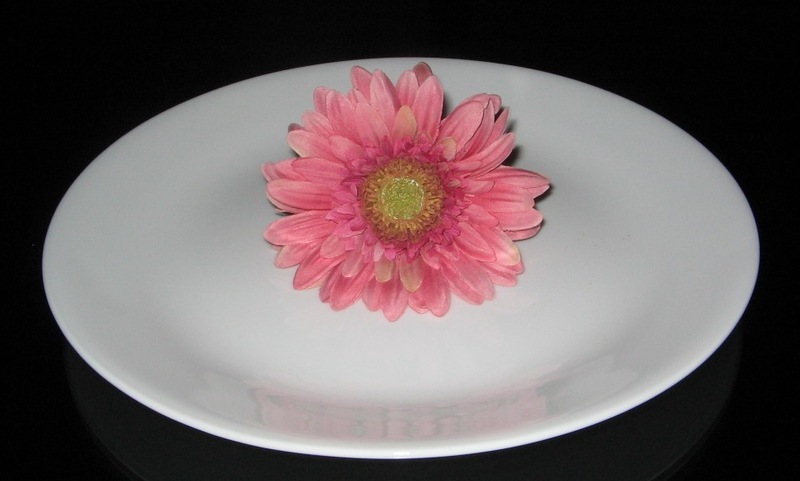 Use it individually on plates or in bowls, or en masse as a part of your centerpiece. Slicing, halving or quartering adds fragrance and visual interest to temporary arrangements. Visit “Summer Blues…and Greens!” for more photos! Visit “Bellini Birthday Brunch” to see all the photos! Visit “Rhapsody in Blue” to see more photos of this table! If you’re looking for a quick way to add a dash of color to your tablescape, consider purchasing a bunch of flowers, dividing into several smaller bunches, trimming the stems down (always cut on the diagonal to allow water to more easily penetrate the stem! ), and plopping them into individual vases to either line up down the center of the table or put at each guest’s place setting. Even the most novice floral arranger can achieve a pretty look at minimal cost! 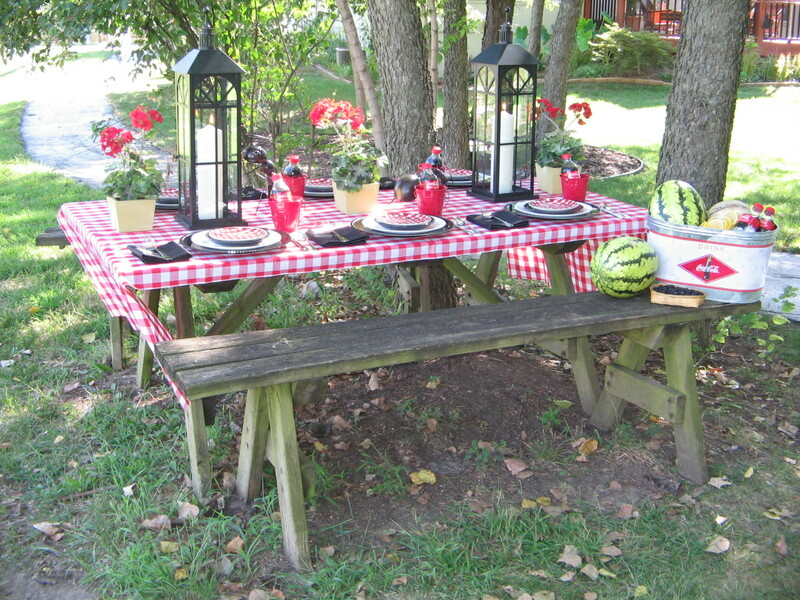 Visit “Dinner With Friends” to see more photos of this table! 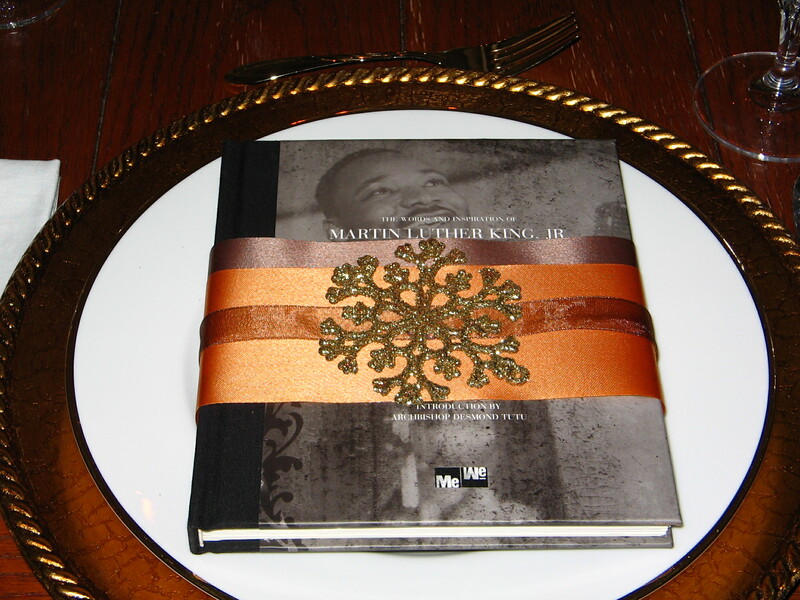 For a quick dash of color, simply cut a length of ribbon to slip around the napkin at each place setting. 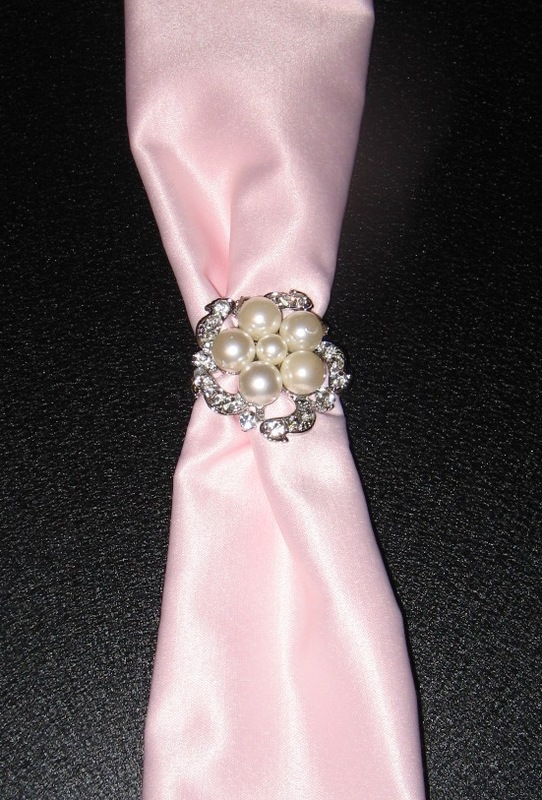 Using two or three ribbons in a stacked position will add real panache! to see this entire table in pink, black & gold! 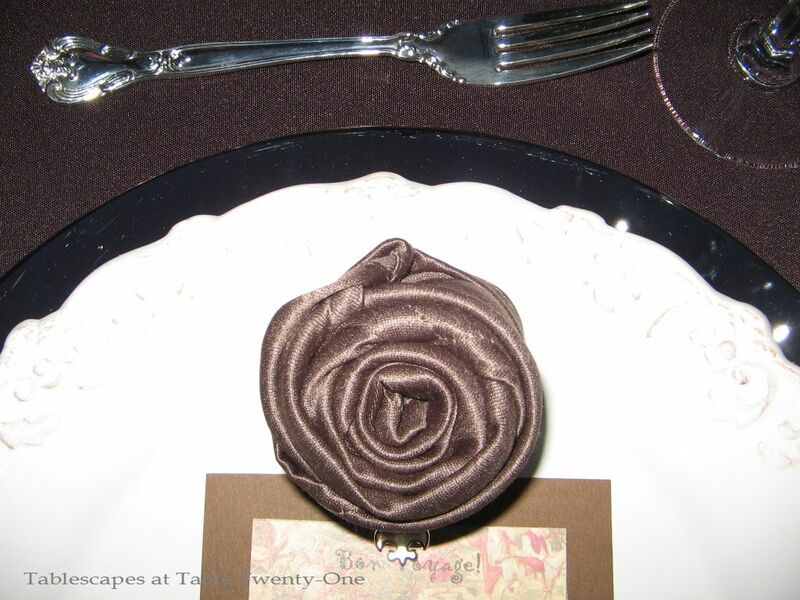 The 3 layers of ribbon as applied to this guest favor can be easily used on a napkin. The snowflake ornament adds extra panache! 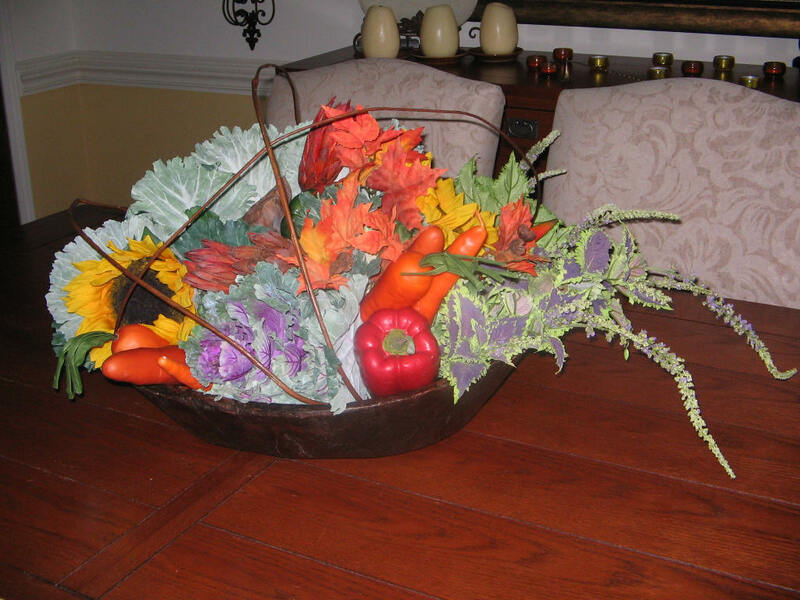 Look around your home for everyday items that can be used to form a suitable centerpiece. Just because you bought an item for one room doesn’t mean it can’t be used in another or in another way! Leather bound books, statues, baskets… Don’t be afraid to experiment! 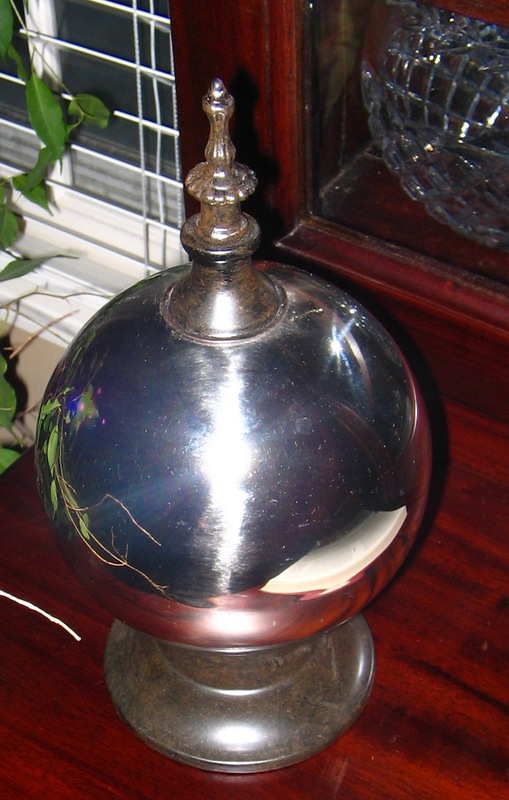 This mercury ball displayed on a secretary in our library…. 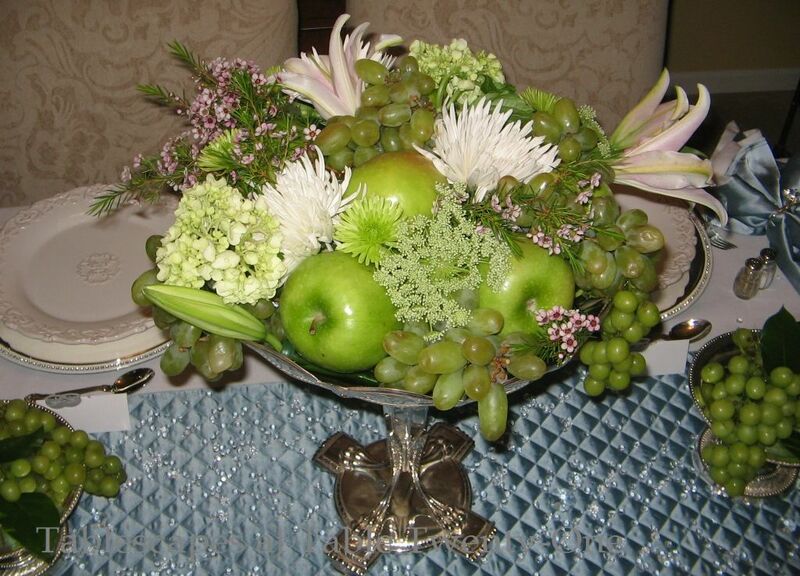 …became part of this lovely ladies’ luncheon centerpiece! Visit “Pleasant Under Glass” to see photos of this entire table! 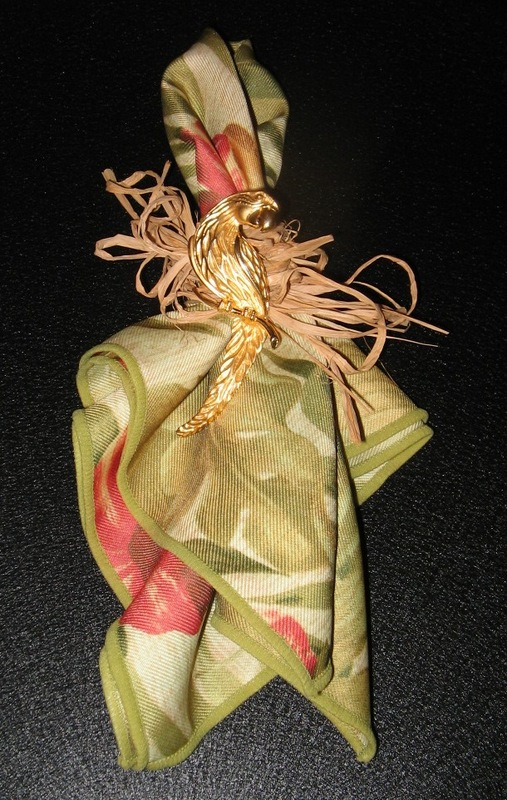 Embellish napkins with intriguing brooches or other costume jewelry. The jewelry needn’t all be the same. Each piece simply needs to complement the others. 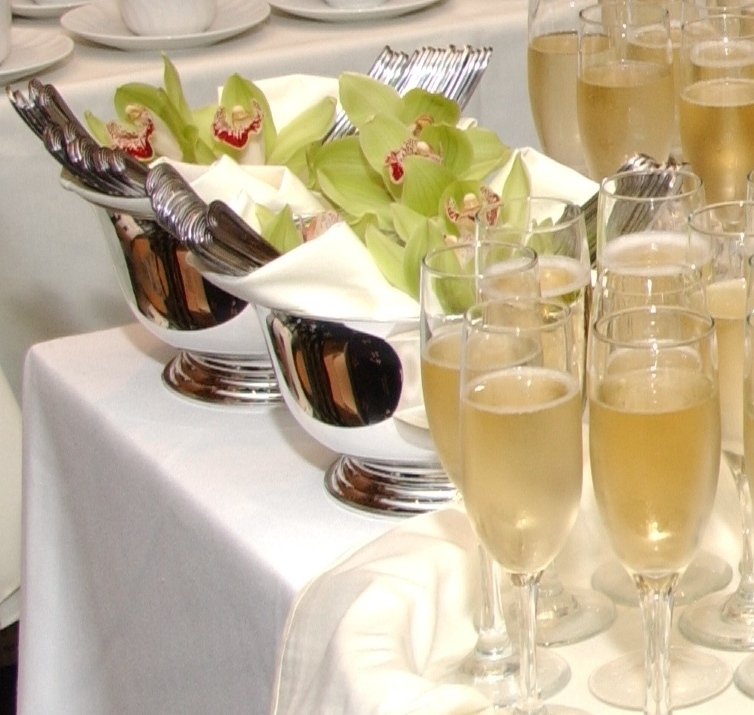 If possible, set your table up a few days ahead of your special event. In doing so, you can walk past it numerous times and in various lights to determine what you might add or change. Sit down at the table and make sure it will be comfortable for your guests. Be sure to check the sight line, too! 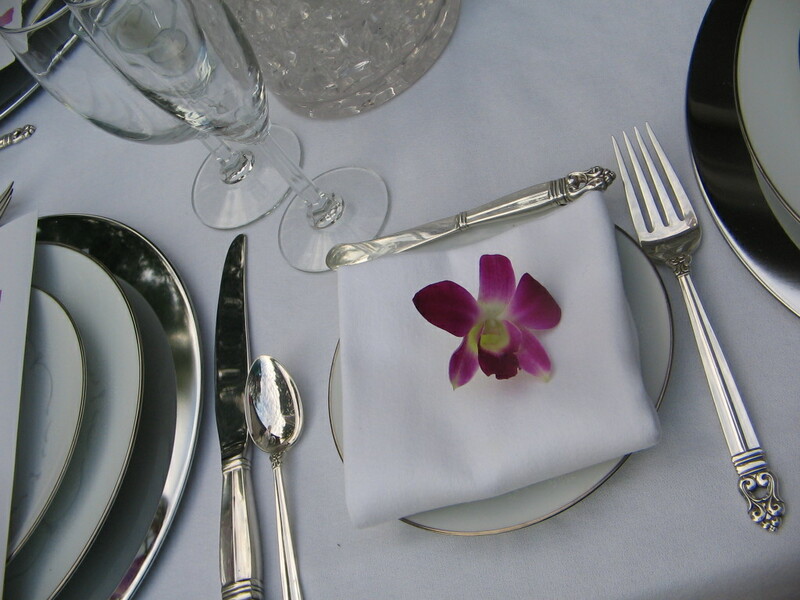 Silver items can add sparkle and shine to a tablescape like nothing else can. Care for your silver by using it often which helps retard tarnish. For those pieces that are kept stored, be sure they are free of all debris (food, dust, etc.) by washing thoroughly in soapy, hot water. Rinse well and dry with a soft cloth. Then because there are always microscopic droplets of water unseen by the naked eye that can wreak havoc with your silver, ALLOW TO AIR DRY OVERNIGHT. 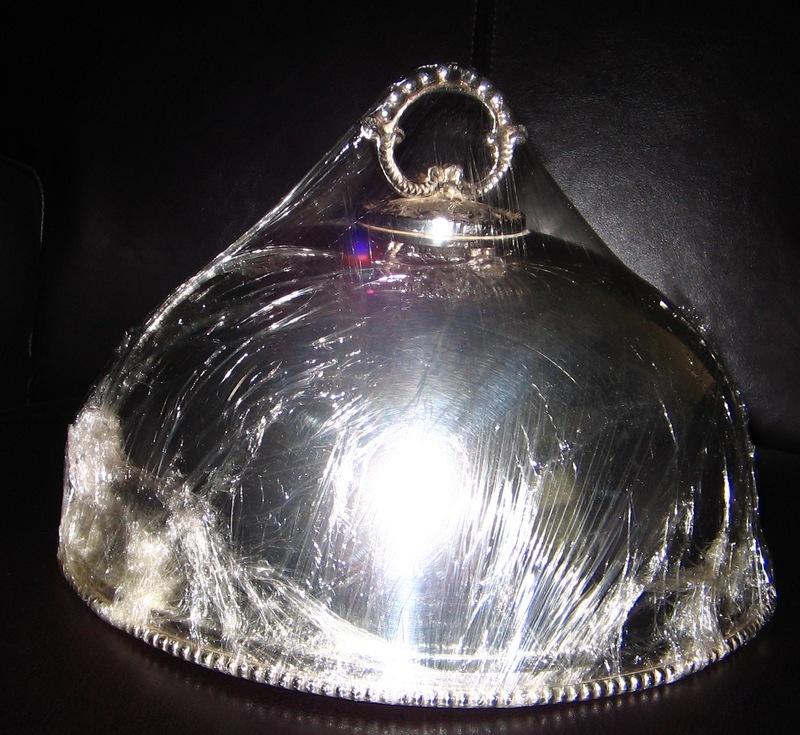 Store silver in plastic Ziploc bags, being sure to express all of the air out of the bag or wrap in clear plastic wrap. For additional protection against tarnish, put the plastic-covered items into a Rubbermaid-type storage box with a lid. When you’re ready to use the item the next time around, it will shiny and ready to go! Don’t discount the lowly glass hurricane. Sure, hotels have used them in comatose ways for eons, but they can be used in so many ways to create standout displays for your tablescape! Hurricanes are available in a variety of colors (clear, red, cobalt, amber), sizes (I have 5 sizes of the clear sleeve style ranging from 7″ – 24″H! ), and styles (sleeves, closed bottom, etched). When used en masse, they can stir up quite a tablescape commotion! 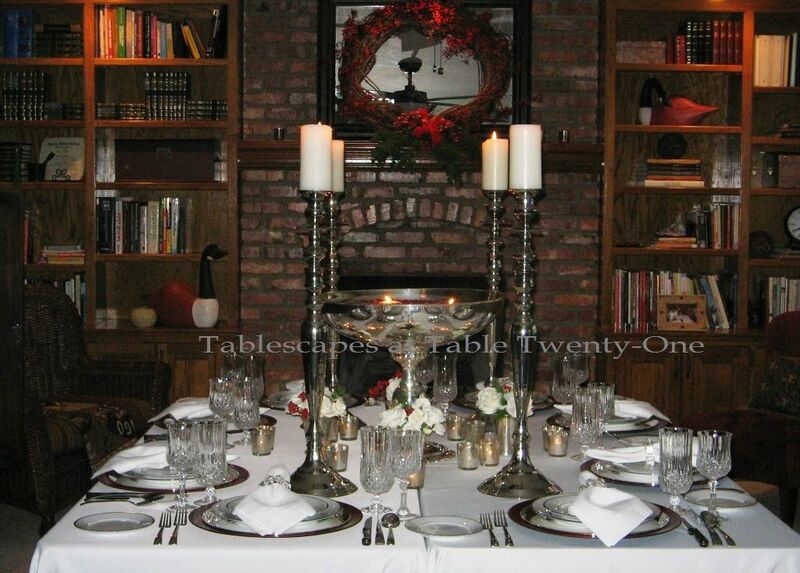 Try using different sizes within the same tablescape for added drama. And don’t just use them for covering candles! Fill ’em up with fruit or flowers for a really dramatic look! Visit “Pears & Pine Cones” to see this entire table! 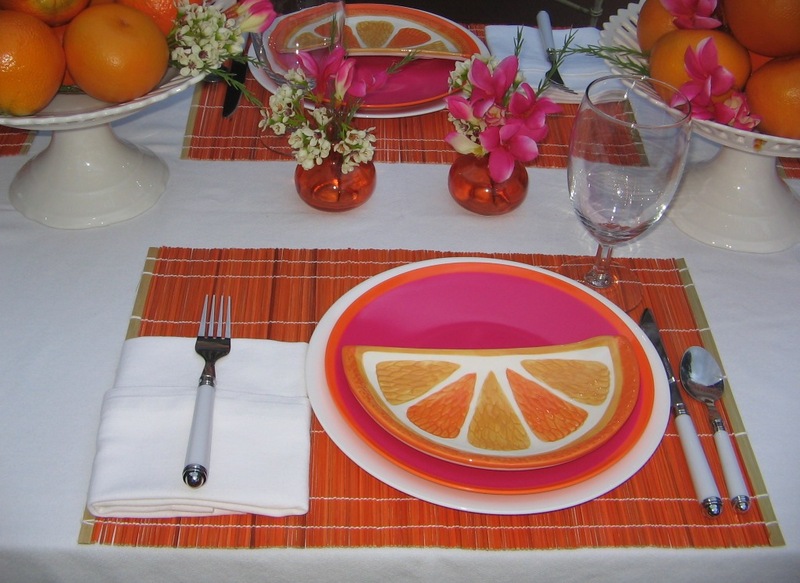 Visit “Orange You Glad You Came to Dinner?” to see this entire table! Visit “Red, White & Blueberries” to see this entire table! 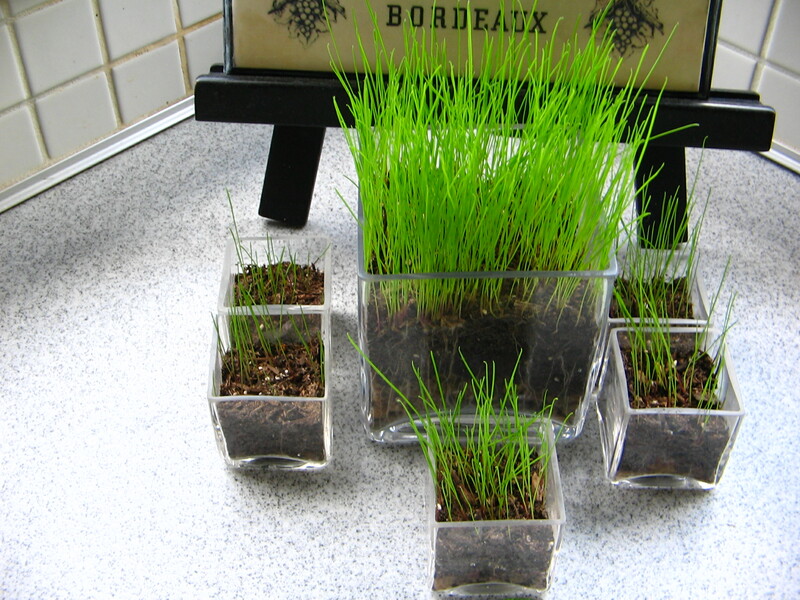 Growing rye grass to use as a centerpiece is easy! Choose any container at least 3”H that you wish. Line the bottom with about ½” pea gravel for drainage. DO NOT SKIP THIS STEP OR YOUR GRASS WILL MILDEW AND DIE! Layer on an inch or two of potting soil. Sprinkle seeds evenly over the soil. DO NOT BUNCH SEEDS UP! 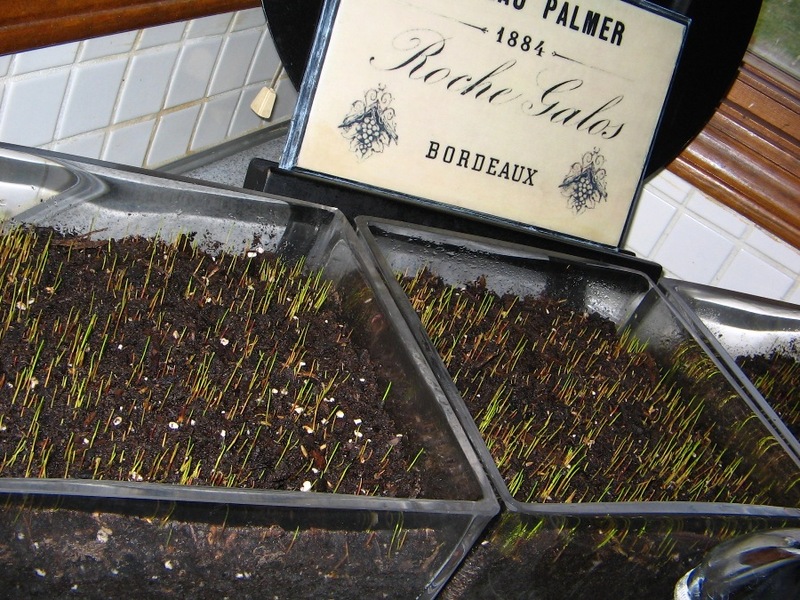 Sprinkle a very thin layer of potting soil over the seeds. Water the seeds using a mister so as not to upset the soil and uncover the seeds. Place containers in a sunny window and mist daily. After about 3 days, you will start to see fine wisps appear. The wisps will become longer and thicker after about a week. In 2 weeks time, the grass will look something like the picture below. And in 3 weeks, the grass will actually need a little trimming! Rye grass can last for several weeks depending on how you care for it. If kept in a sunny spot, gently watered every 2 or 3 days, and trimmed once a week, your chances for longevity greatly increase. 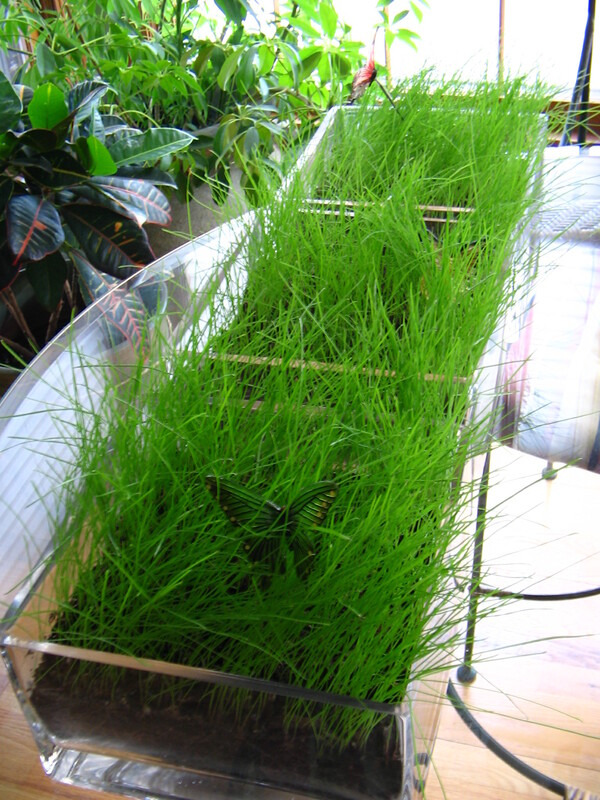 Visit “Grazin’ In the Grass” to see a table using rye grass! To achieve a wider surface for your tablescape, consider “kissing” tables horizontally to create more of a square shape. Two 6′ tables positioned horizontally will comfortably seat up to ten people. Those same two tables will seat up to 14 vertically, but will not provide as much space in the middle for your centerpiece. Two 6-ft. tables positioned horizontally. Visit “Au Revoir” to see more photos of this table! The look works well indoors, too! Visit “Cranberry Christmas – Squared” for the whole post! Divide and conquer! If on a limited budget, pricier flowers can still be used if divided into smaller arrangements or by plucking the blooms to use individually. Orchid stems usually have 5 – 10+ blooms that can be plucked and used individually to spread color and texture over the table without breaking the bank! Visit “Love & Orchids” to see this entire table! 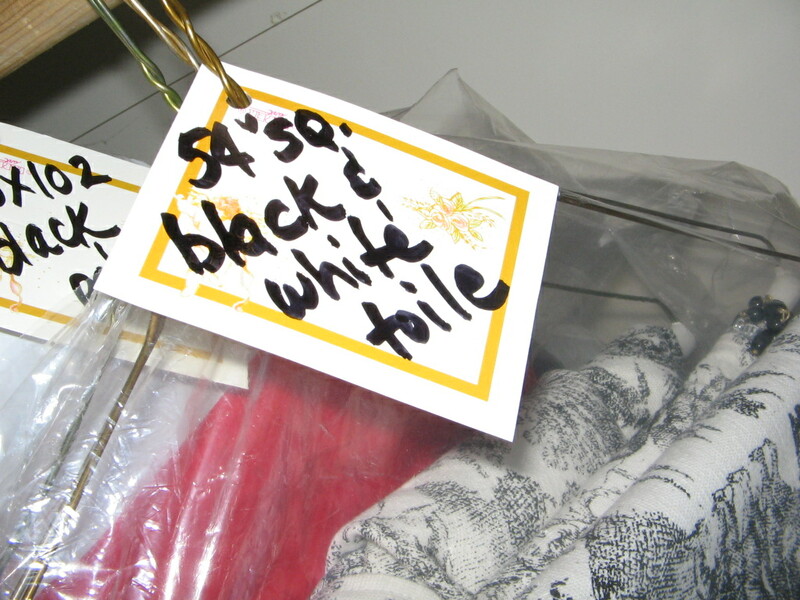 Fold linens lengthwise and hang on trouser hangers to keep visible folds at a minimum. I use plastic clothing bags from clothing stores & the laundry to cover my linens. Not only does it keep errant dust from settling on the linens, but keeps them from contracting unwanted folds and wrinkles when packed into my linen closet by allowing them to “glide” against one another. (Leave the bottom of the plastic open on natural fabric linens to allow them to “breathe.”) To make finding linens a breeze, I tag each hanger with the color, size & shape and then arrange them all by color in the closet. Until we get a house big enough for a linen room to hang linens on huge rollers like in a fabric store and with a mechanized hanger like at the laundromat, this method will have to do! 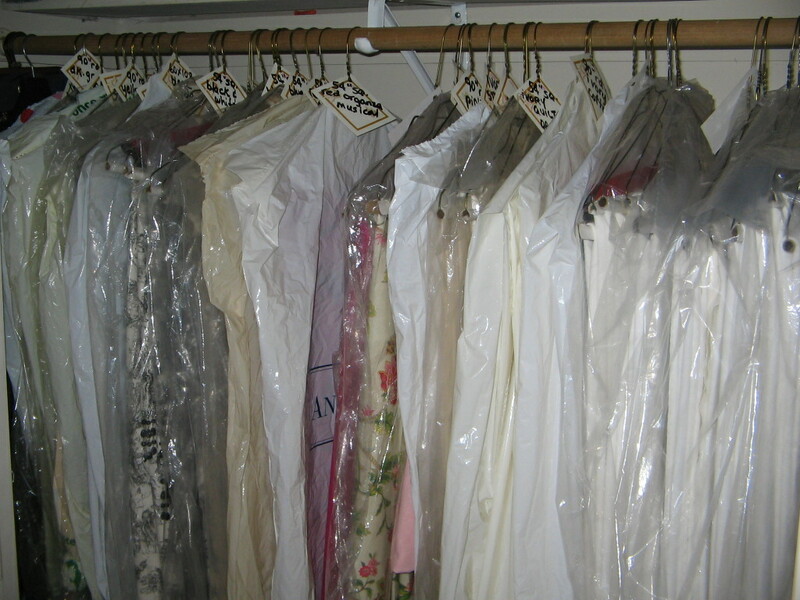 Linens on trouser hangers, covered with plastic sheathing. Just punch a hole in a piece of cardstock, and voila…youve got yourself a tag! Still just can’t arrange flowers to save your life? Snip the heads, preserving only about an inch of the stem, and tuck them into similarly shaped/sized clear vessels with just enough water to cover the stem. Visit “Autumn Orchids” to see the whole post with these vases in various sizes. 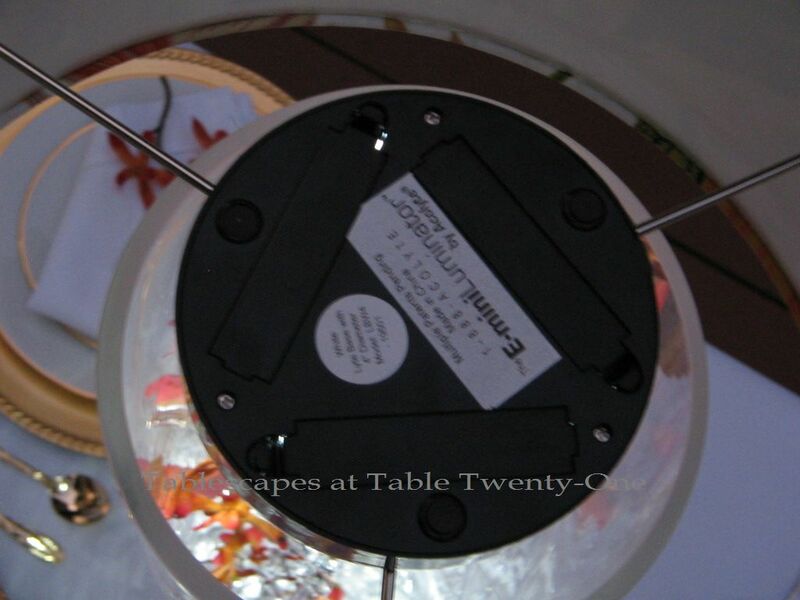 To see this lamp completely assembled and used in a tablescape, check out “Fete Noir Et Gris“! 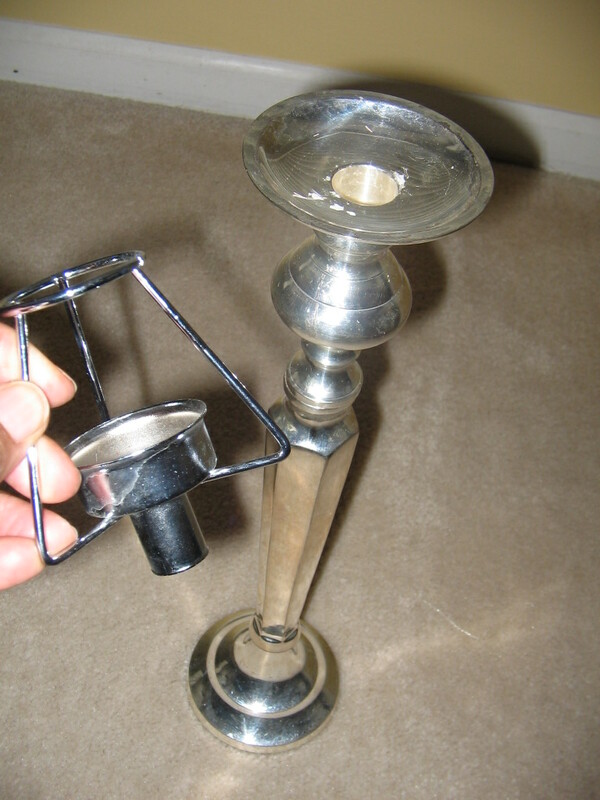 Another creative way to construct a tabletop lamp is by using a vase for the base. It adds girth and flair, and it really opens up your choices! 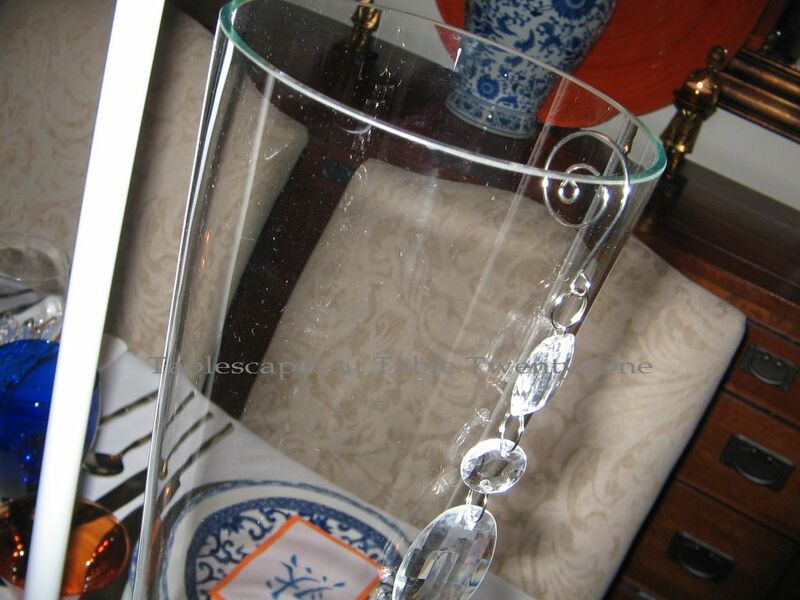 With the wider mouth of the vase, however, you may need to add a clear plastic or glass plate that is wider than the opening to keep the shade from sinking down. The larger the plate, the taller the shade will stand. The plate is also a good spot to place your LED votive. For something a little different, I like to place the LED votive upside down. Doing so allows both illumination of the shade and a reflective glow in the glass vase. 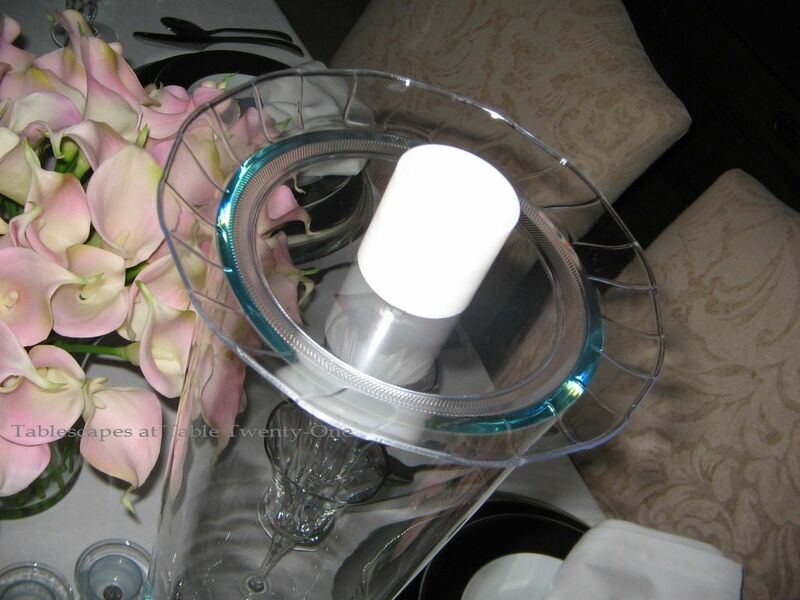 Using a colored LED votive will produce a soft gel effect. 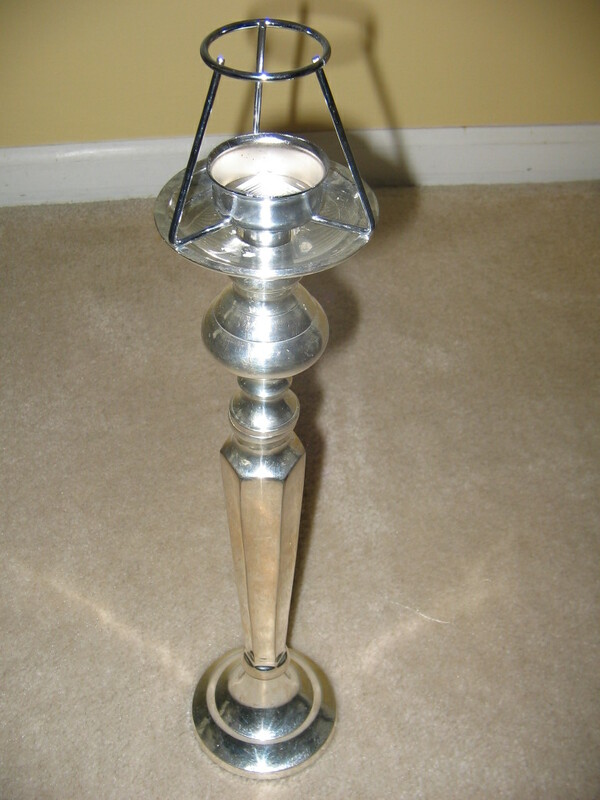 To see this lamp fully assembled click here. One of the least expensive ways to create dramatic height for your centerpiece is to start with a base of curly willow or other decorative branches. Curly willow branches can be purchased through your florist for a nominal cost. They will be green & supple when purchased fresh. They will last practically forever (although eventually the green will pretty much disappear, and they will be mostly brown) if kept in a cool, dry place. The branches usually come in one of 3 sizes (tips which are about 18″H, medium which are about 4-ft.H, and tall which are about 6-ft.H). Decide which size will best suit the arrangements you want to build for the ceiling height in your home. Place the branches in a suitable container and then just add other greenery, flowers and desired accessories. Or use the branches by themselves! 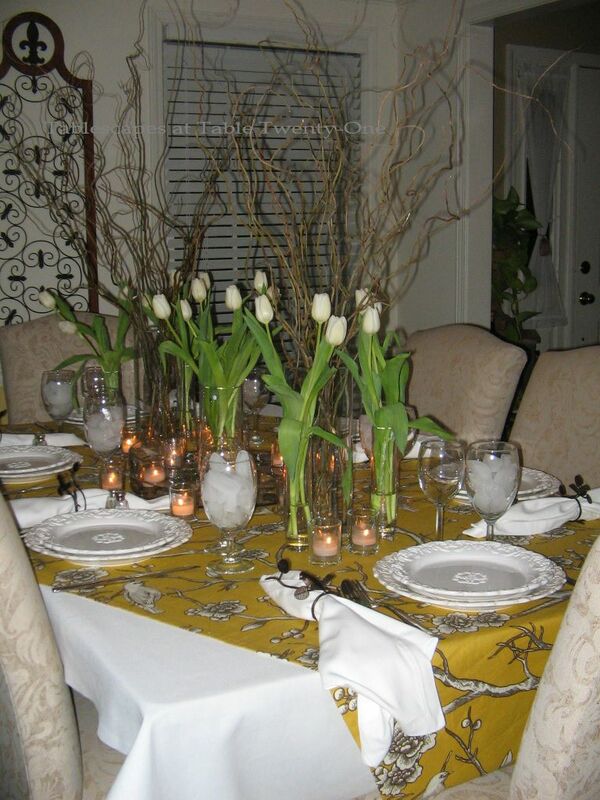 An example of using curly willow branches to add height, girth and plain ol’ drama to your centerpiece can be seen here. Yes, maybe it’s a little OCD, but taking a couple of minutes to measure equal distances for your centerpiece items is well worth the trouble so that guests see your table at its optimum best! For long tables, measure and place 1/3 the length from each end for pairs. 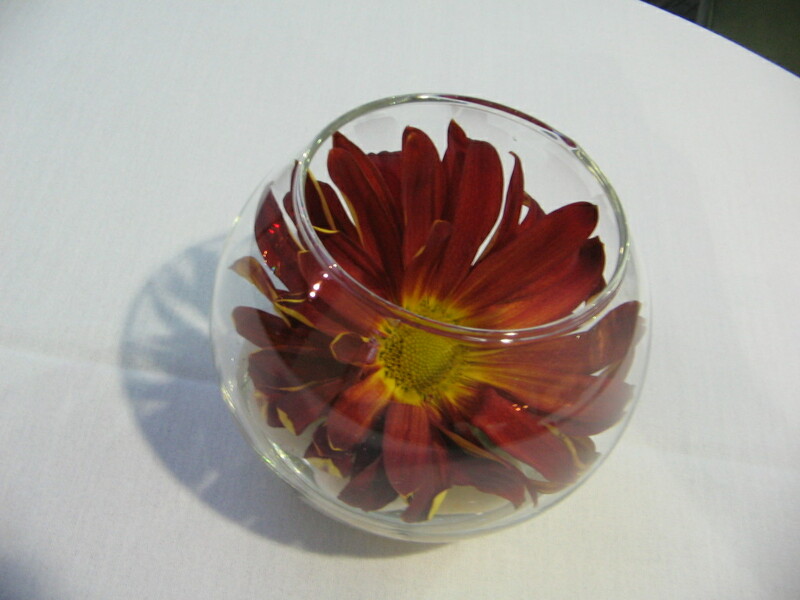 For centerpieces involving three items, simply place one in the center. While we’re on the subject, it’s not a bad idea to measure and evenly place the plates and flatware on each end first, then place the remaining settings on the space in between. Like how this table started out? Click here to see the finished look! 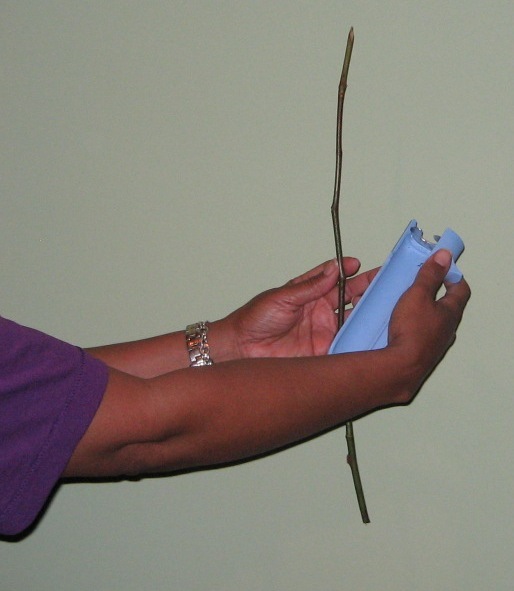 The demonstration below is with a stem that no longer has a bloom on it. Follow the steps below, and it’ll be naked as a jay bird in no time! Firmly hold the stem just beneath the bloom. Clamp shut, and pull the stripper downward in one swift motion. One of the quickest and least expensive ways to add pizzazz to florals on an evening tablescape is to infuse a little “bling.” Pearl head straight pins or those with the “gemstone” heads that simulate diamonds, rubies, sapphires and more are just the ticket for glamming up a ho-hum arrangement. This little treatment works best in compactly constructed flowers with solid centers such as carnations, roses and daisies. Just insert the pin straight into the flower’s center. It’s not necessary to treat every bloom in the arrangement with this added touch, but the more the merrier! Visit “Planning In Purple” to see more of this table! Check out “Proud As a Peacock” to see this entire table! 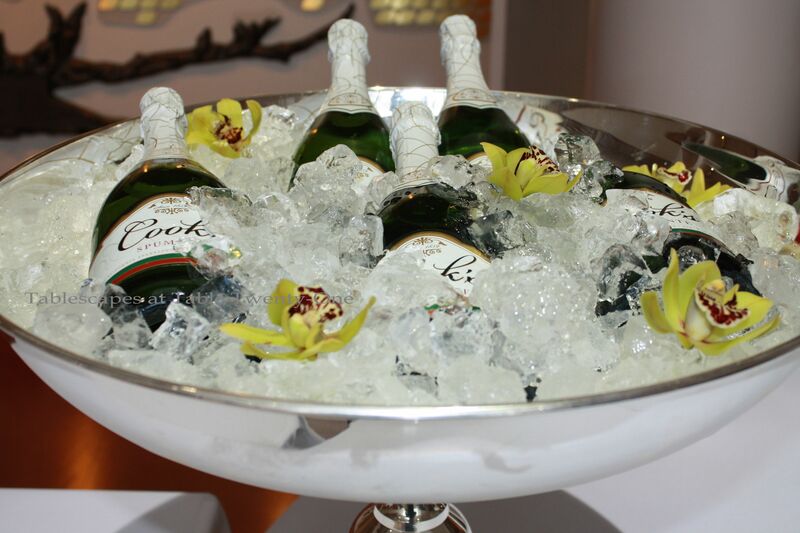 Oh, for cryin’ out loud….Don’t just shove bottles into a bucket of ice and stick it on the beverage bar! Dress those bad boys up a little! When using fresh flowers, you are almost always sure to have a few spare blooms. Place them strategically among the bottles to add color, texture and fun to the whole look. Adding a little extra bling is always fun. Try suspending crystals from the underside of a floral ball using a safety pin, a couple of hair pins, or T-shape wig pin. (I angle hair & wig pins for greater holding power.) 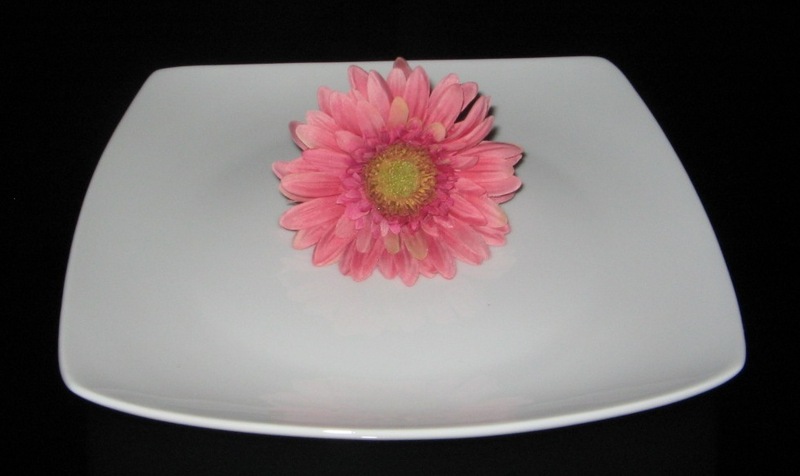 You can also try taping or hot gluing it to the bottom of a floral design plate. Just be sure to sit beneath it and look up to make sure you’ve completely hidden all of the mechanics. Safety pin slips into the loop and attaches bling to bottom of rose ball. Garlands of bling can be hooked to the lip of a vase and obscured by the floral arrangement on top. These handy dandy hooks are plentiful in stores around the Christmas holidays, or you can create your own using floral wire. 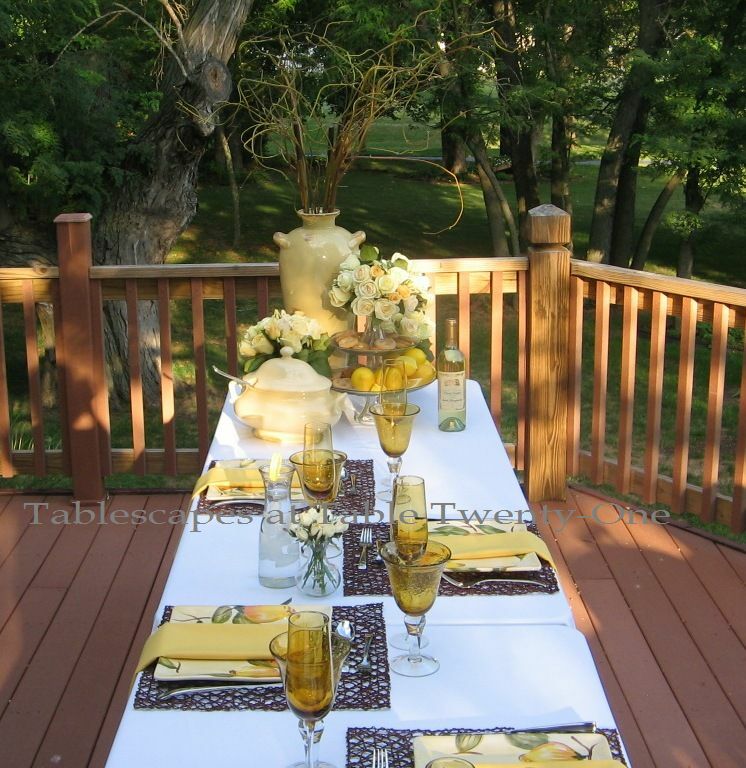 Click here to see how this look was used in a formal tablescape. 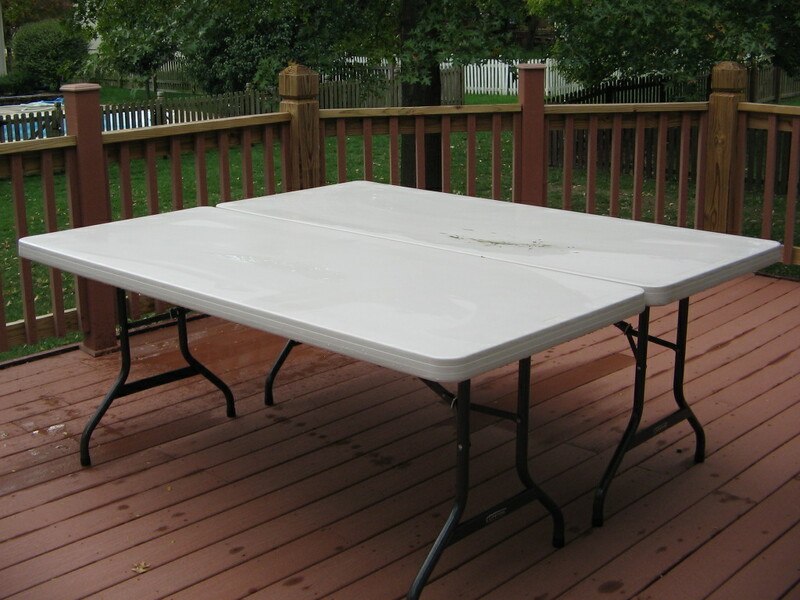 Many oblong outdoor tables are a measly 30″ wide which can turn decorating into a bit of a dilemma. Here are a couple of tricks to add visual interest to the tabletop and solve the space problem. To see the whole post and the table from various angles, click here. Stagger the placemats to keep them from overlapping! 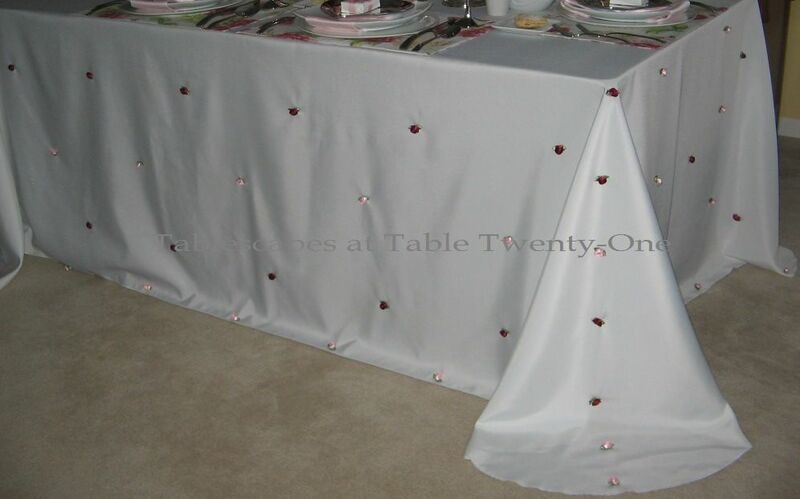 This solves the problem, adds a neat pattern to the tabletop, AND allows a little more elbow room! 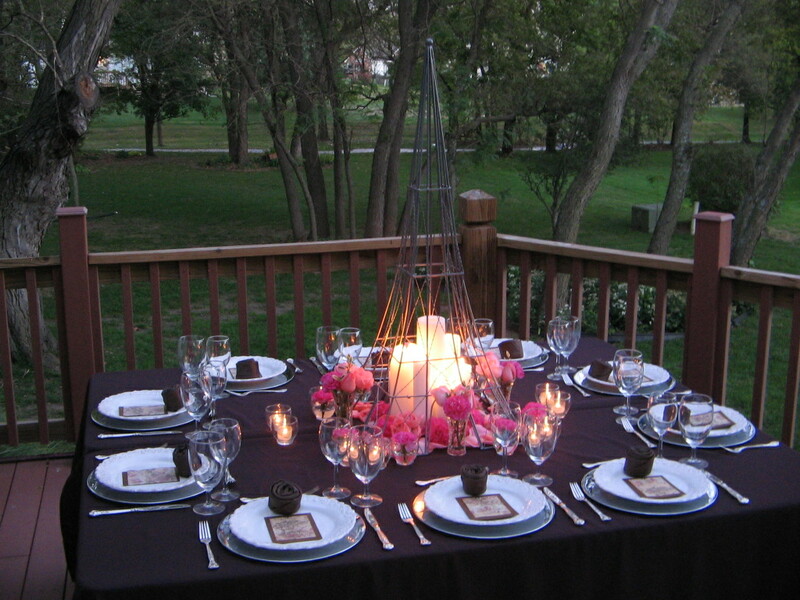 Place the larger elements of the “centerpiece” at the END of the table. Dot the length of the table with smaller objects that tie into the main display. From a 3-arm frame, tie strands of floral garland to hang at varying heights within the glass vase. Slide the garlands around on the arms until you get the look you want. You can construct these garlands using fishing wire to sew buds on at various intervals, or you can purchase ready-made garland. 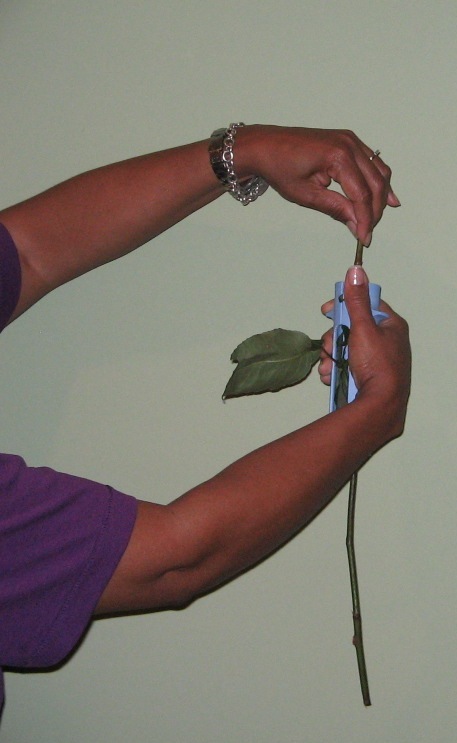 (For fresh flowers, insert needle in the sturdiest part of the bloom rather than the more fragile petal.) The “bling” is also hung from the frame with hooks. 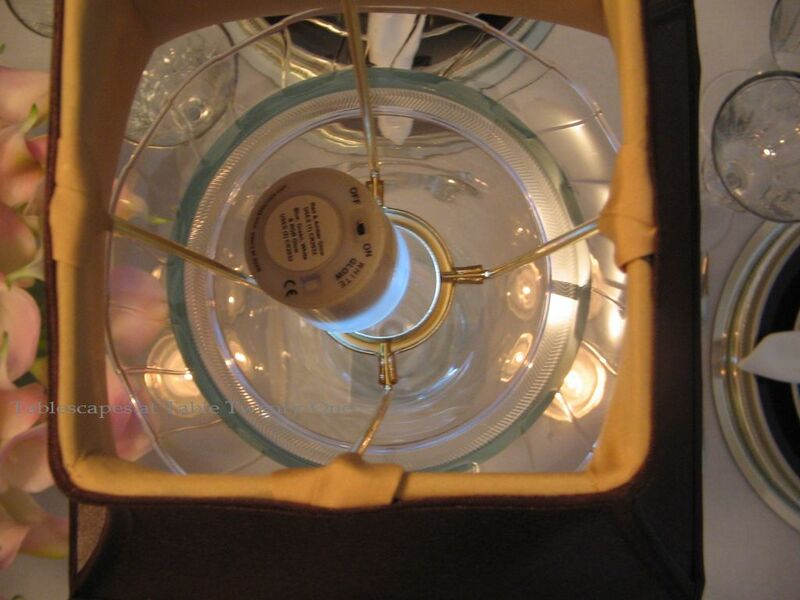 A battery-powered multi-pinhole uplight is flipped upside down and placed in the center of the frame to direct the light downward and reflect inside the glass. Use clear floral tape to secure the light to the frame. Garlands are tied to the 3 arms of the frame, and the uplight is secured with clear floral tape. All of the bling is illuminated from top to bottom! Need to elevate a candle inconspicuously under a clear glass hurricane? 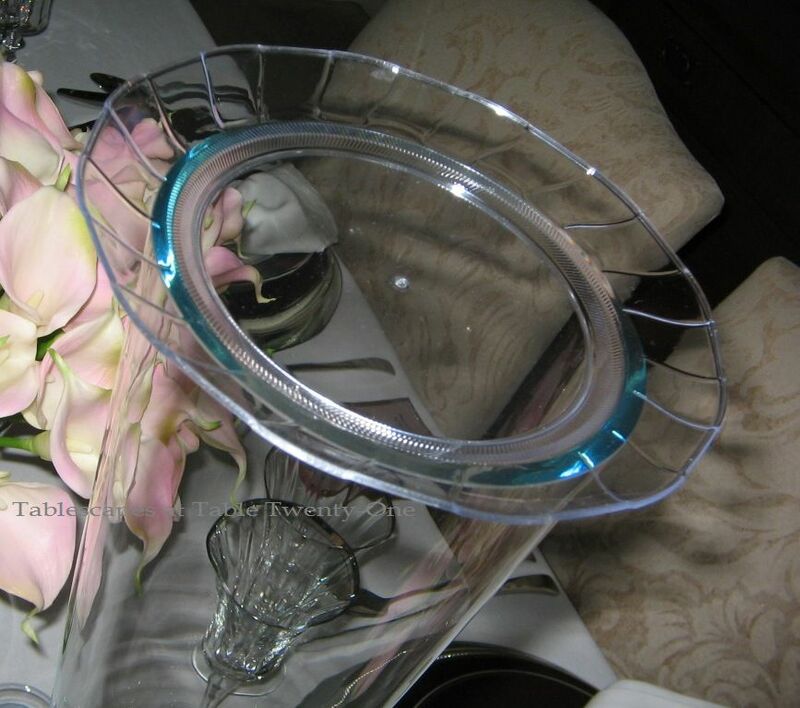 Invert a clear glass vase and simply use it as a stand! 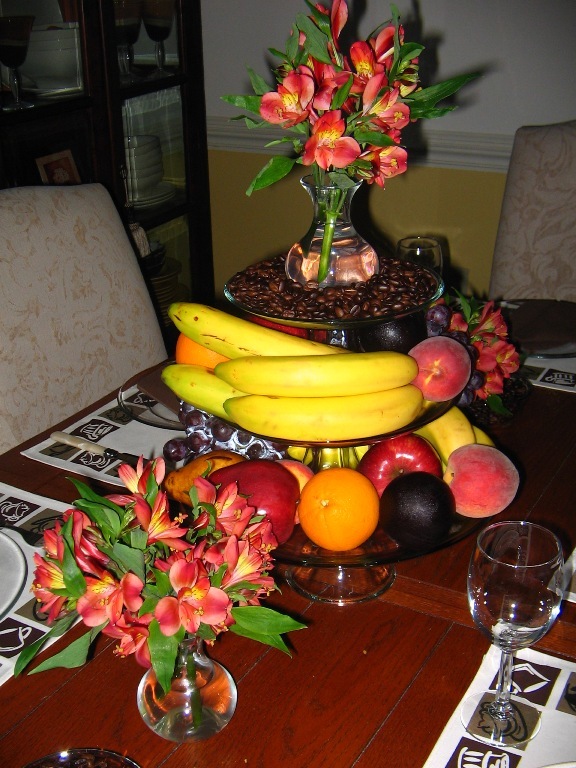 I often fill the inside of the vase and the outside between the vase & the hurricane with something fun like fruit, stones, nuts or flowers to give it a little more “oomph!” To see this entire post’s photos, visit “September Wine“. 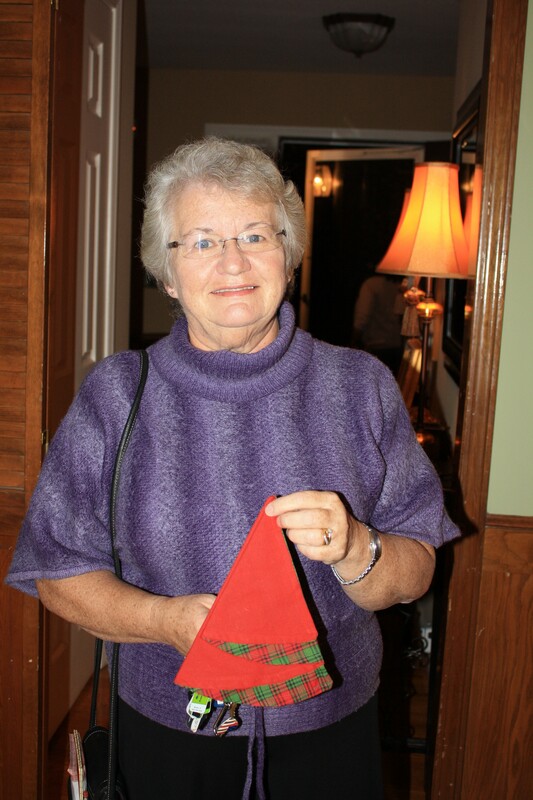 My very talented friend & neighbor, Barbara (who can cook, sew, quilt and everything else crafty under the sun! 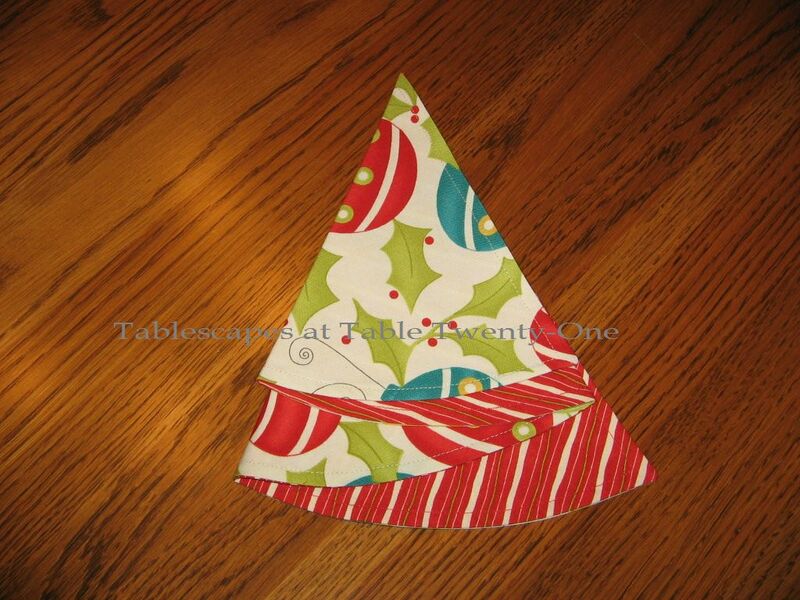 ), constructed these cute Christmas Tree napkins (a.k.a. the Half Circle Napkin Fold) for use at our annual cul-de-sac Progressive Dinner. She was gracious enough to allow me to share her technique with you! If you prefer the video version of Barbara’s demonstration in my “Tablescaping a Winter Wonderland” class, click HERE. 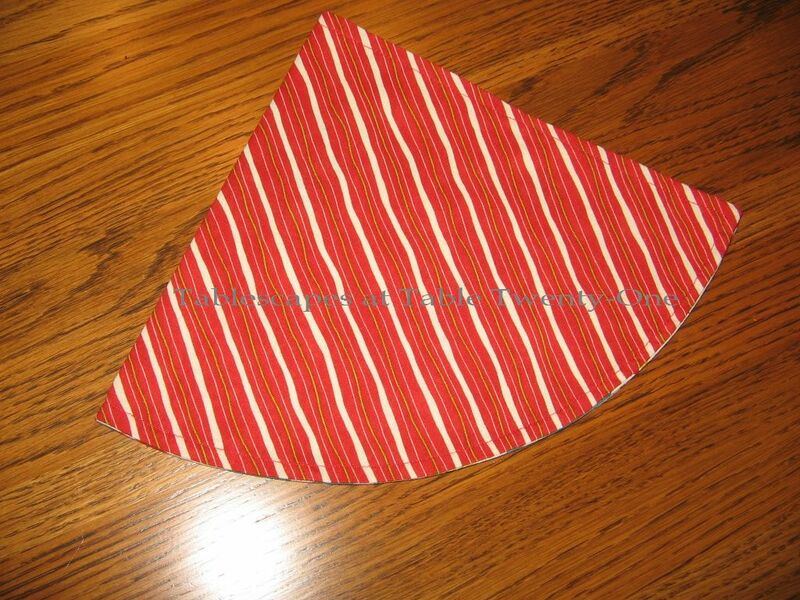 Lay a half-circle napkin flat. 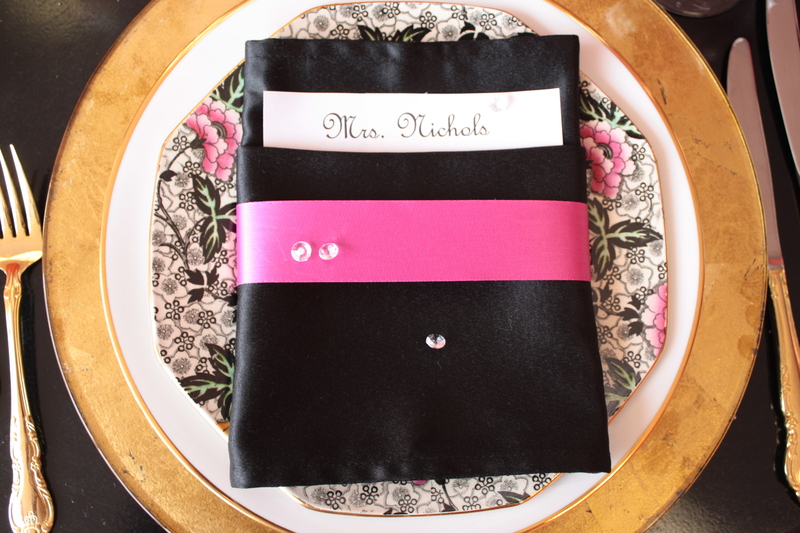 A napkin with contrasting sides works best. Fold in half and press firmly with a warm iron. 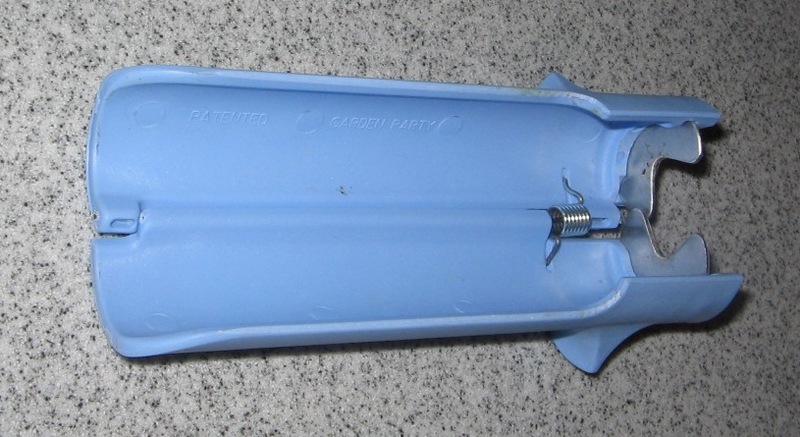 Open and refold 1″ to the right of the center, right sides together; press firmly with iron. Fold right corner over, lining the outer edge to the fold; press with iron. You should see the right side of your fabric. Fold the corner of the left side over, lining up the edge with the right side; press firmly with the iron. Flip over and repeat, making sure to press firmly with the warm iron after each fold. And voila! The finished product! 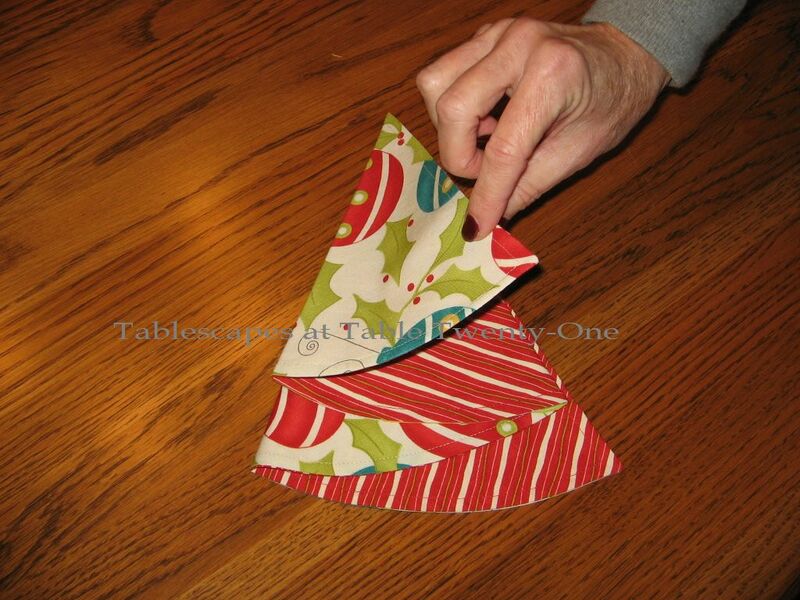 A festive holiday napkin in the shape of a Christmas tree! It’s easy! One of my terrific students, Vickie, even crafted some for herself. Looking to fancy up a table linen but either don’t have a lot of time, the money, or sewing skills? You sound just like me! 🙂 Here’s what I did to make up for it: You know those little silk rosettes you can buy at the craft store? Those teeny ones that seem to have little purpose in life? Simply pin them in any desired design to the linen! Speaking from experience, this is best done BEFORE you put the linen on the table!!! 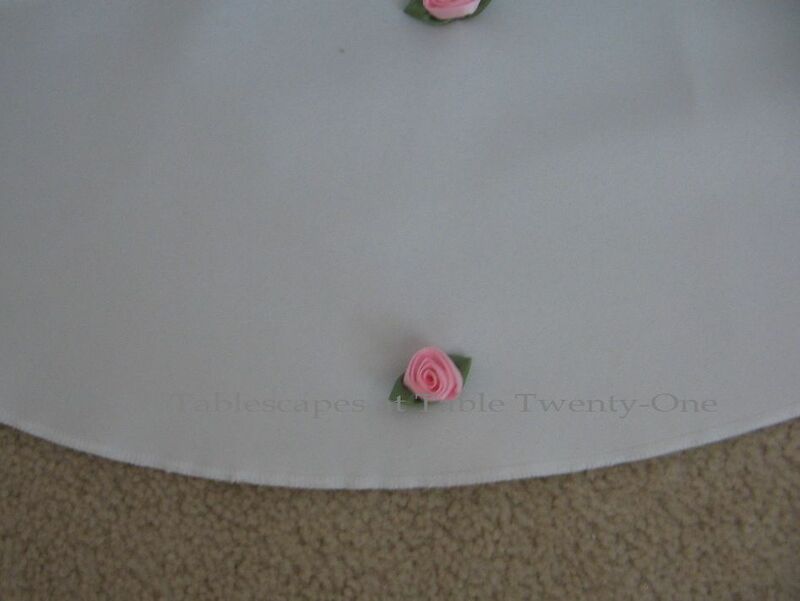 Lay it inside out flat on the floor or on a bed, and simply pin each rosette into place. It’s that easy! Visit “Days of Wine & Roses” to see this entire tablescape! Step 1: Lay out a square napkin on the diagonal. 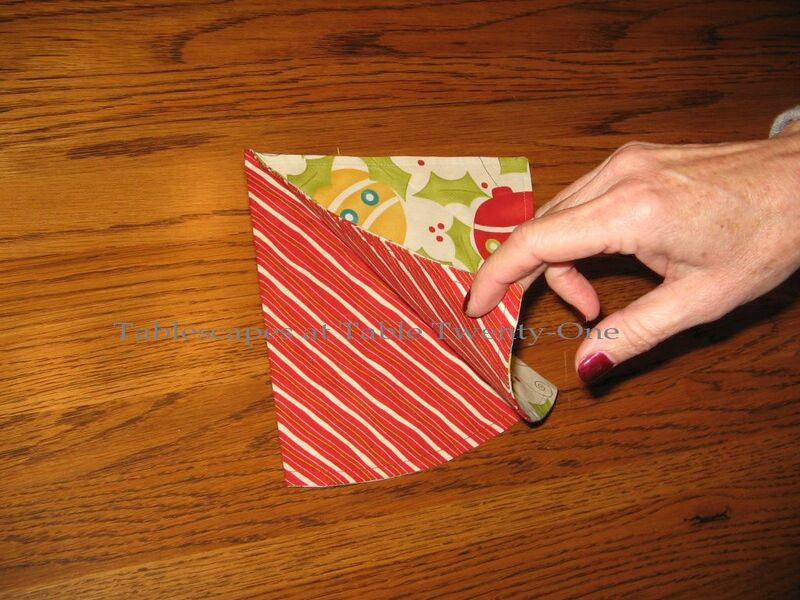 Step 2: Fold about 3 inches of the top of the napkin down toward you. 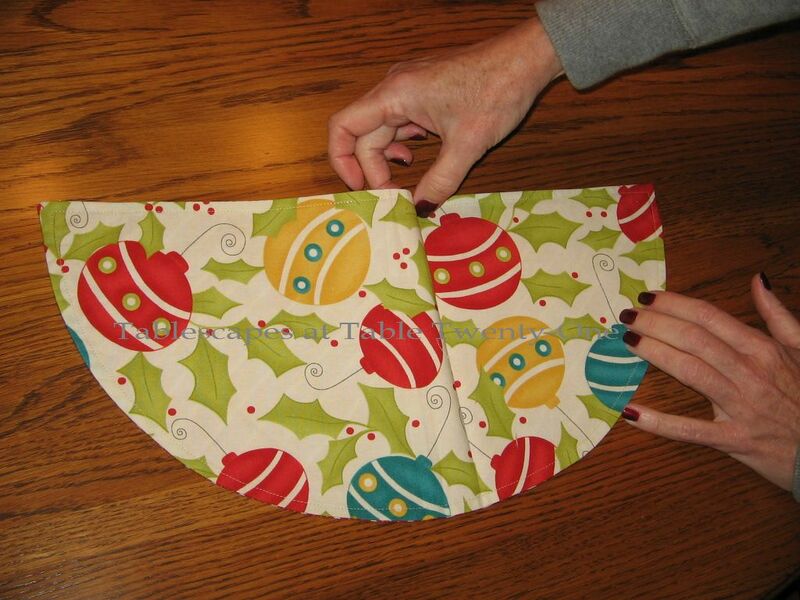 Step 3: Fold the napkin from the new top toward you in approximately 1 inch folds. 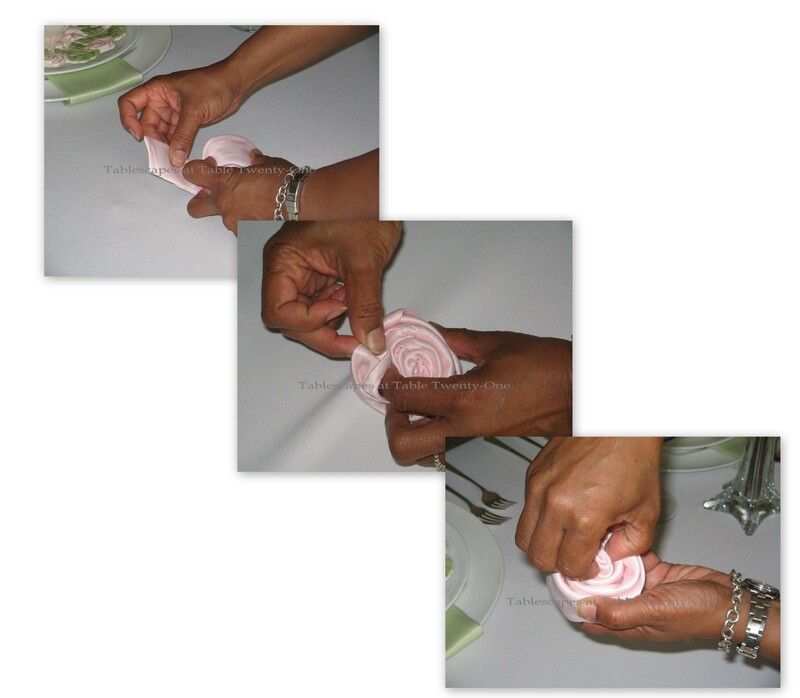 Step 4: Continue to smooth the napkin out as you keep folding it toward you. Step 5: Once the napkin is completely folded, secure the middle where the fold ends with your finger and begin rolling the napkin inward from one end. Step 6: Keep rolling, and make sure to keep the roll tight. Step 7: Keeping the napkin pulled tight, continue rolling until there’s just a little tail left. 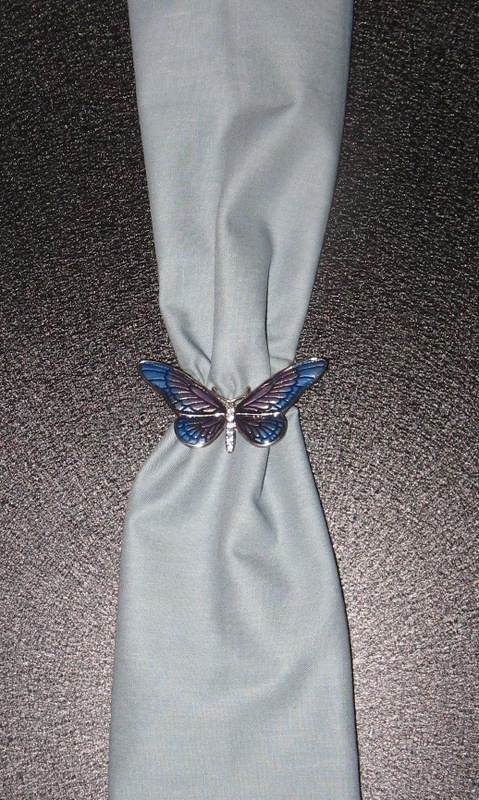 Step 8: Tuck the tail into the folds of the napkin. Step 9: Pinch upwards on the center to create a 3-D effect. 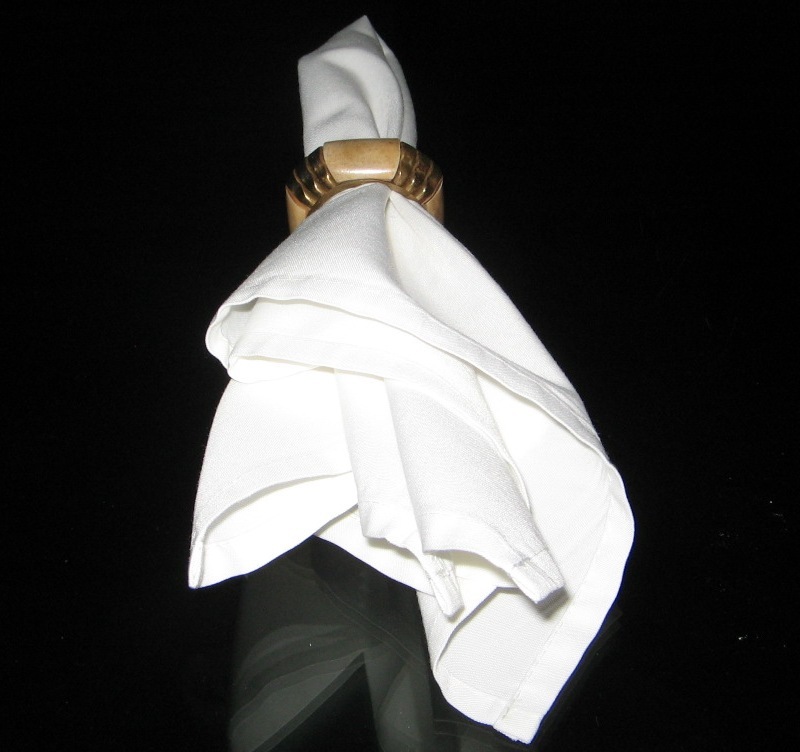 Click HERE or HERE or HERE to see the full posts associated with this napkin fold. When I’m making plans for a table to be set up off-site and don’t have a similar table at home, I just use a measuring tape! For instance, for a 12-ft. table (which I certainly don’t have space for in my dining room! :-() I pull the measuring tape out 12 feet across the family room floor and play with where to place the floral arrangements or other decorative accoutrement! When I have to play with both centerpiece and place setting placement, I use masking tape to create an imaginary table on the floor! (Kind of like a crime scene drawing! 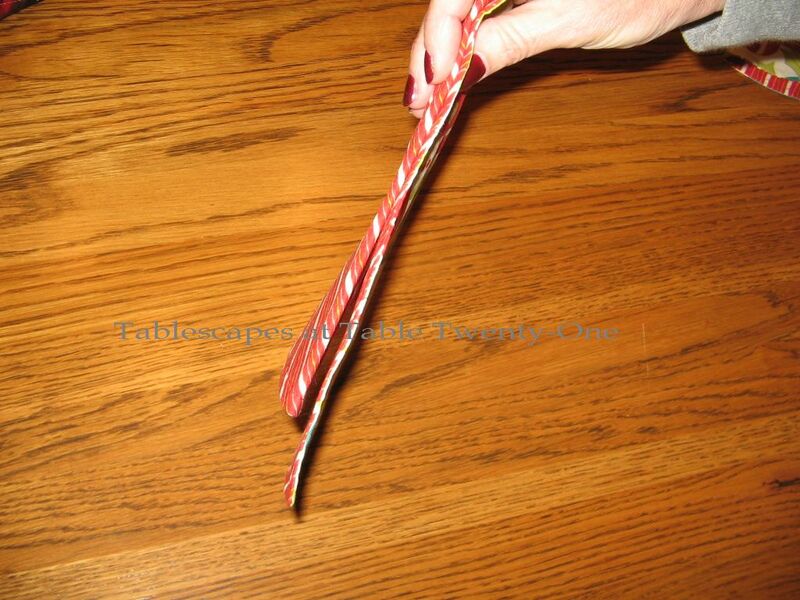 :-)) This is also a great tool if you’re relying on someone else to set the table up. Just take a picture (or several) of it all laid out. You can print it out along with written instructions (e.g., “Place 1 vase at 14-in., the next at 28-in., 2 votives at 21-in.”) or send it to their computer, I-Pad or phone! It’s like a dress rehearsal for your table!!! To see the post with floral arrangements, visit “Purple & Pastel Tablescape“. In every guest bath in our home we have a basket of folded white hand towels for drying hands. Guests can use a clean, dry towel each time with no worries of transferred germs…especially important during cold and flu season! Guests can then just toss the used towel into a mesh bag-lined pail. It’s easy to just remove the mesh bag and toss it in the washer. You don’t have to touch the soiled towels AND everything gets clean at once! This is such a luxury for guests (like in fancy hotels & restaurants), is safer for the environment and ultimately less expensive than paper towels, AND it prevents the spread of germs! The towels can be bought in bulk at Costco or Sam’s Club. Use an old silver toast rack for a pretty countertop towel holder. 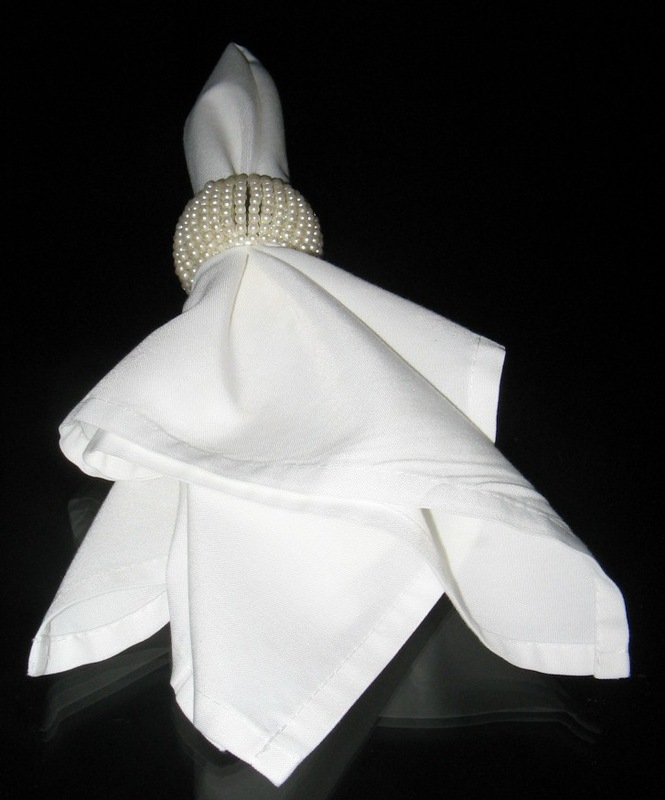 Fabric napkins are easily and conveniently stored using fabric shoe holders designed to fit over a closet rod. (I bought these at Walmart for about $6 each.) No toppling over, easy to see, easy to access! Be sure to amply reinforce the closet rod to withstand the weight. If you’d like to see the post on how and where I store all my stuff, visit “Hoarding…Buried in Dishes & Decor“. Pictured here are about 600 napkins distributed among five 10-compartment shoe holders. Over-the-door towel racks are great for storing table runners! Pictured here are about 25 runners on 3 rods. 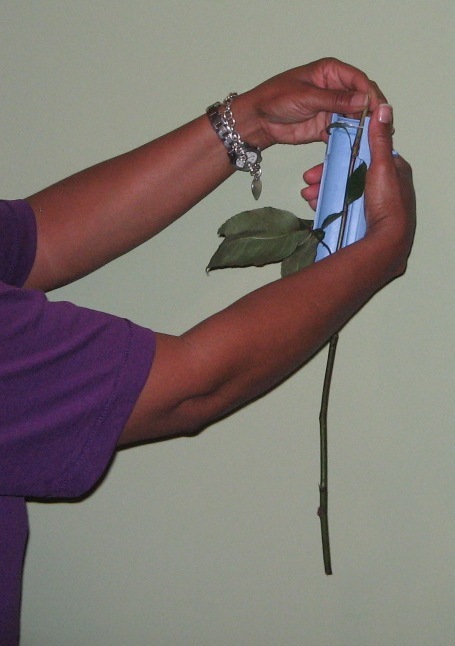 Save those leaves from faux flowers to use as filler and to hide the mechanics of your arrangements. In the photo below, silk leaves are hot glued onto the sides of the floral foam bowl to obscure the bowl’s dark color and add a more natural-looking element to the arrangement. 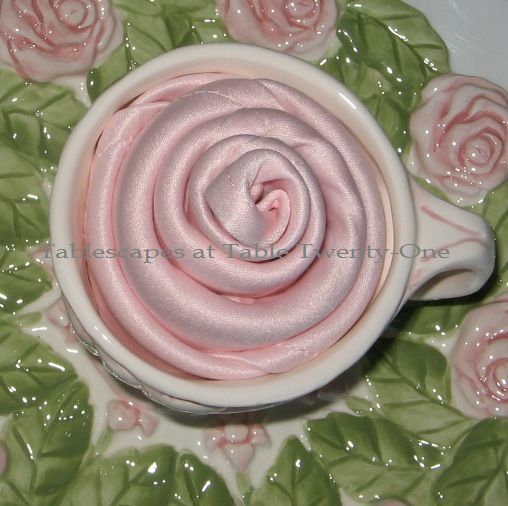 Visit “Platinum & Pink Valentine” to see the finished project used in a tablescape. When you want to use fresh roses that are still a little tight, no worries. Just bring them to room temperature and carefully begin the process of gently coaxing the individual petals back to form the perfect rose! You really must exercise both patience and care, but the end result is beautiful! Get creative and think outside the box to get greater use of your tabletop elements. Example? Martini glasses aren’t just for martinis! Try using them for serving salads or appetizers! A few fun accessories for creating winter tables that sizzle! ALL THE BLING YOU CAN GET YOUR HOT LITTLE HANDS ON!!!!!!!!! Any and everything in silver, gold, copper or bronze!!! Flowers in seasonal colors (e.g., roses, carnations which can create a “snowball”, gypsophila and white astilbe because they look like snow when bunched up, magnolias jasmine, skimmia, cockscomb, amaryllis, amaranthus, paperwhites, poinsettias). Just about any flowers that don’t specifically scream spring (like daffodils or daisies) will work. Candles, candles, and more candles!!!!! Spray paint for gilding everything from leaves to pinecones to….you name it! Thank you, Aimee! And thank you for coming over from HGTV to check it out!!! I really, really appreciate it! You’re a doll!!! Okay…got a question. How do we keep the tables from seperating when we place them side by side? I have always been just a little afraid to do this because someone (probably me lol) is going to bump something and send the whole thing crashing! Oh boy huh? Is there a trick for this one. Oh by the way these are awesome tips!!! Good morning, Wendy! I hope you’re having a great weekend! I have never had a problem with them shifting, but if this is a concern for you I would suggest tying them tightly underneath with twine. Be sure to tie towards the top AND bottom to keep those bad boys from moving one iota! Hope this helps!!! Great tips! So glad to find your site. Love it! Thanks for these great tips, Alycia! Wow so many great tips! This should be a go to post for any questions tablescapers might have! Oh my! Those are a LOT of tips!!!! While I wrap my silver in plastic wrap, I’m didn’t know about the drying overnight part. I guess that happens anyway as I polish before using, use, wash and then wrap. But I’ll definitely think about the next time I pull the silver out. Wow, Alycia, what great tips you shared! I appreciate having all that knowledge at my fingertips!! Amazing table tips and tablescapes! Wow you are very talented. Enjoyed my visit so much!!! Thanks for your visit..I’m so glad so that I could find your blog! Hard to pick a favorite table they are all so pretty! Oh my goodness! You should write a book! Such great tips. I’m saving this for a reference. I got lots of helpful and creative idea!!!! Thanks soooo much! Well, I certainly came away with some very helpful ideas. Wow thanks so much for all t he great tips! These are great tips, a real reference book. Where do you buy followers? 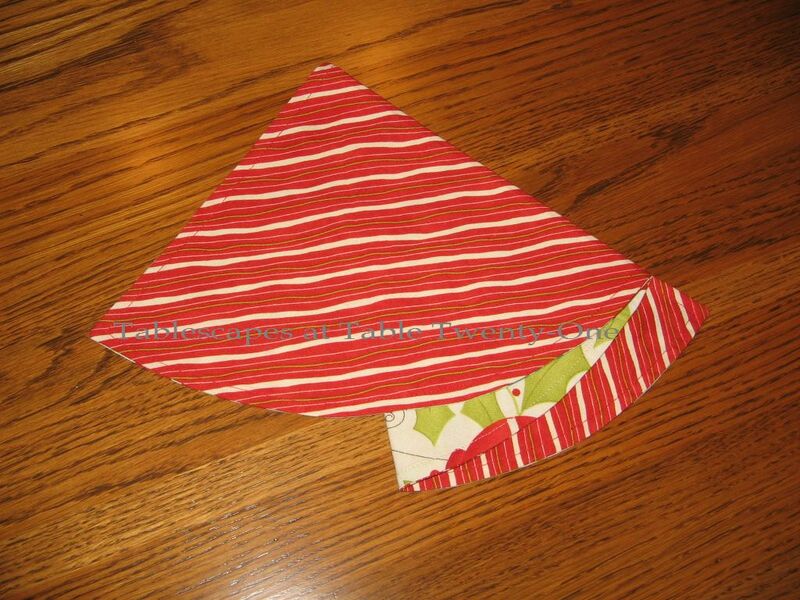 I amde those Christmas Tree napkins, i always say I am going to make more! Thanks for linking up to Let’s Dish. Where is that fabulous blue and yellow table though? This post is bookmarked on my computer. I’m going back to read it again. You have so many good ideas. I think one of the other posters is right. You SHOULD write a book. Thanks so much for sharing your great tabletops. I hosted an anniversary party for my parents this past weekend and i “borrowed” several of your ideas. My tabletops were much more elegant as a result! Thanks again! I linked over from your Hot Tropical Tablescape to read these tips. I read them ALL! You shared so many tips in such a great way… I not only looked at all the pictures but READ. 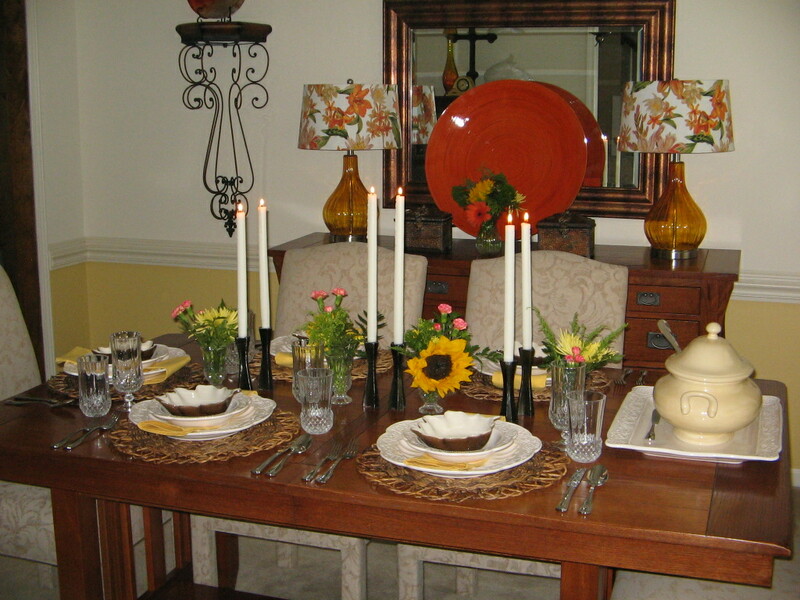 WOW….love love love ALL your tips,they are very informative and your tablescapes are BEAUTFUL as well!! So glad I “stumbled” across your blog! For my daughters wedding, I would like to have a table featuring wedding photos of relatives of the bride and groom (grandparents, parents, etc)…any ideas on how to make this extra specialand unique? Also, I want to do an ice cream sundae bar for dessert. 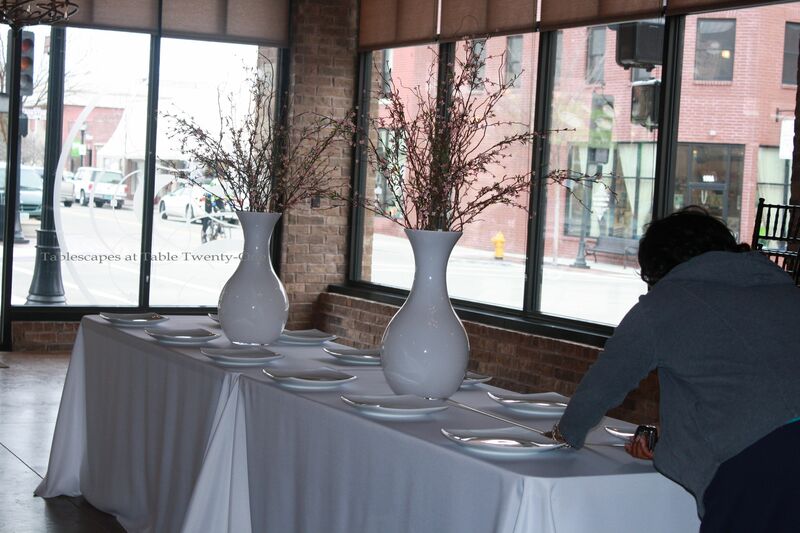 How can we make it as stunning as you would do if you were the wedding tablescape designer for us? Alycia, Alycia… I must tell you…I have used 10 of your tips on my holiday table. I wrote each one down and implemented each one. Please, if you have time, visit my post and see Happy Holidays. I’m so excited…This is my new and favorite thing to do…I love it… Thank you again.